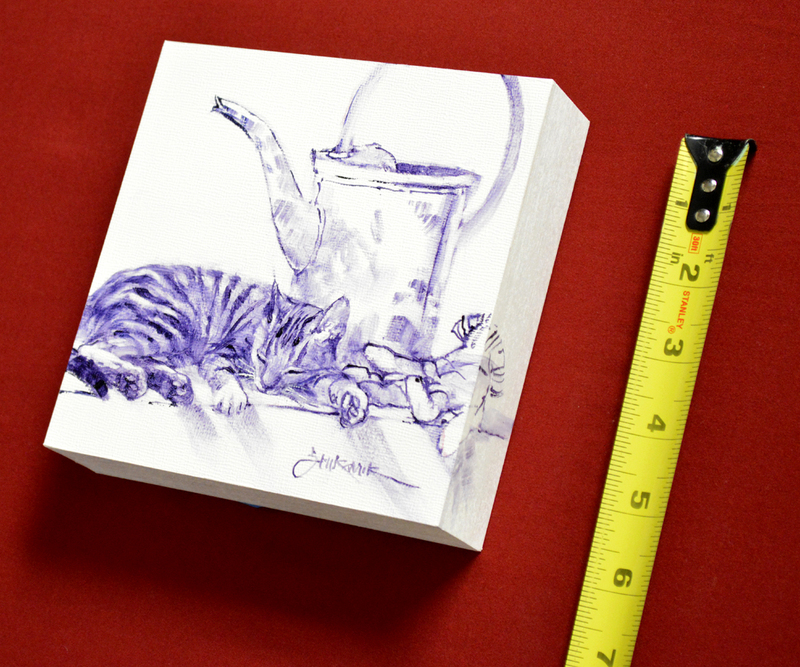 I’ve listed a few more of my VIGNETTES: Visual Melodies from My Heart on eBay! 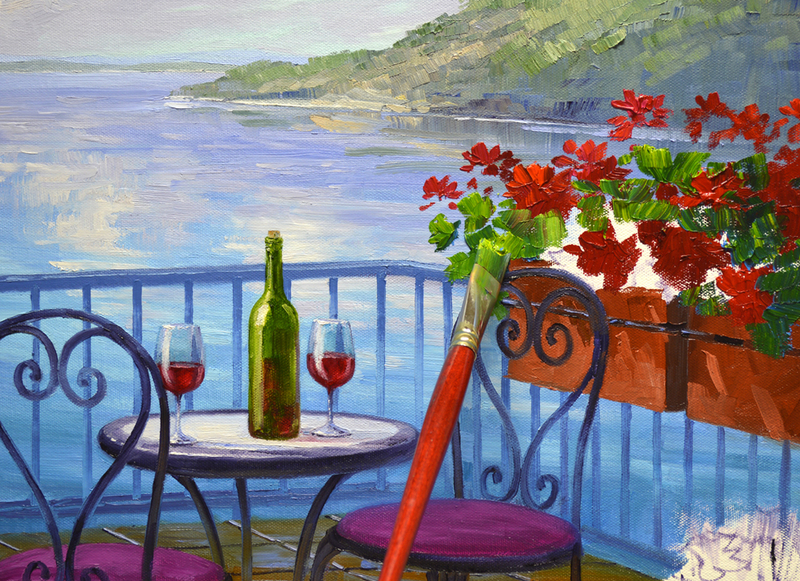 I can’t carry a tune in a bucket but my paintbrush dances to the melodies of the memories playing in my heart. 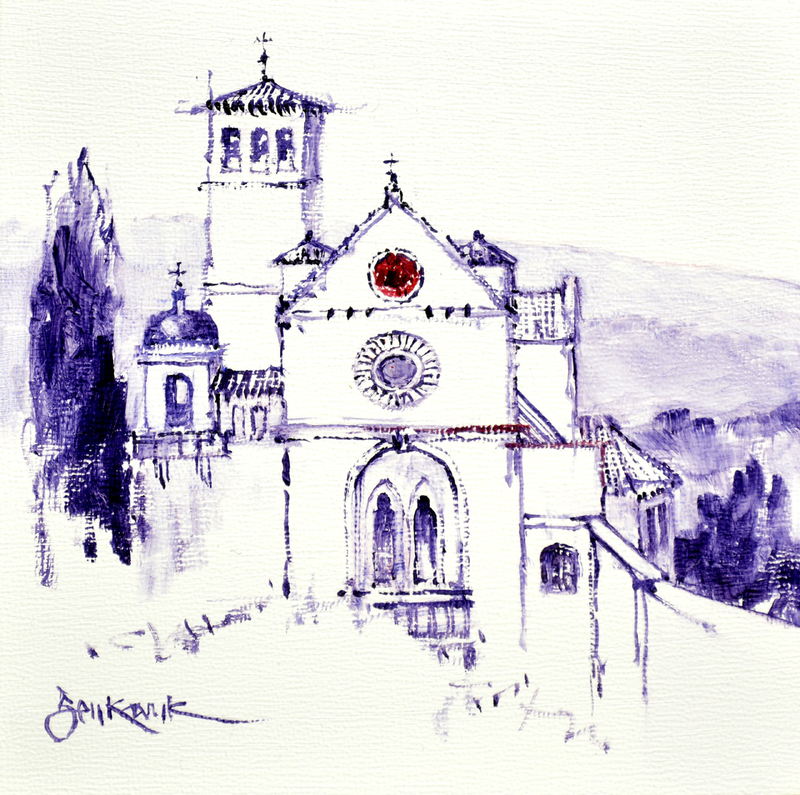 These Original Oil Wash Vignette Drawings, done exclusively for my eBay collectors, are based on sketches I made as Jack and I traveled the world. 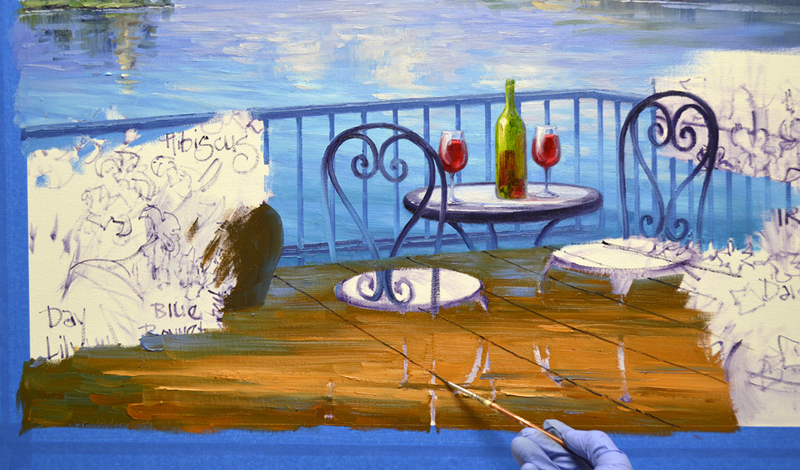 Years ago Jack came up with a way for me to do small pieces while having a larger painting on my easel! At that time I was working on a 6 foot by 8 foot painting. If you’d like to see CLICK HERE! We’ll begin our journey today in the lovely beach side community of Carmel, California! Have you ever dreamed of living on the coast where you can open your windows at night to be lulled asleep by the sound of the surf? Enjoy your morning coffee sitting on the balcony, dazzled by the gleaming sea as you watch seagulls dipping and diving in the sky? Or open your back door to lazily descend the steps and wiggle your toes in the sand of your own Private Beach? 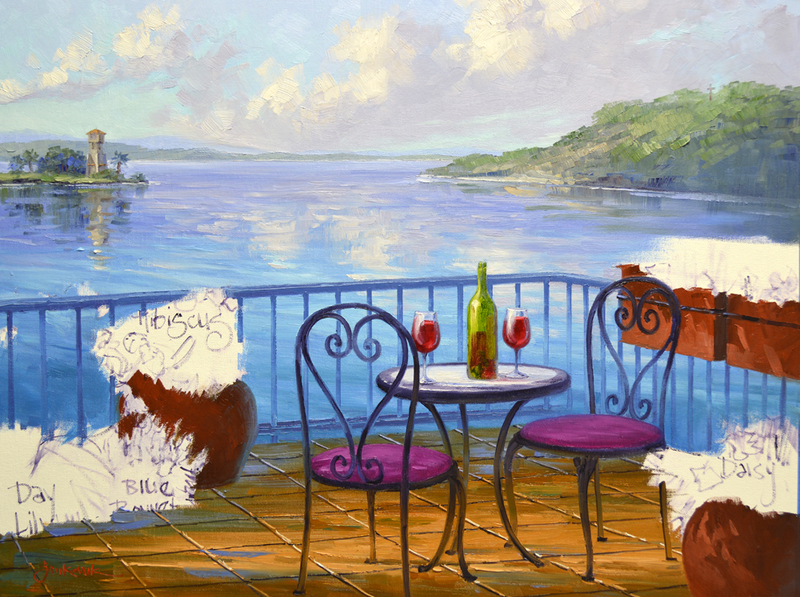 ESCAPE the real world and do that every time you view A Private Beach on your home or office wall. The drawing spills over the side of the 6 inch by 6 inch cradled panel. You don’t have to worry a bit about doing any framing! And…..the bidding starts at ONLY A PENNY! 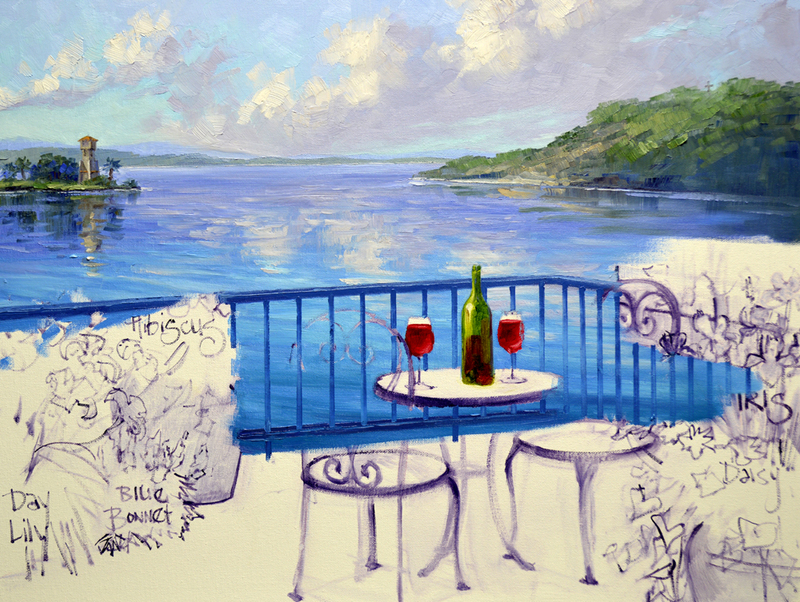 Now let’s go to Provence! 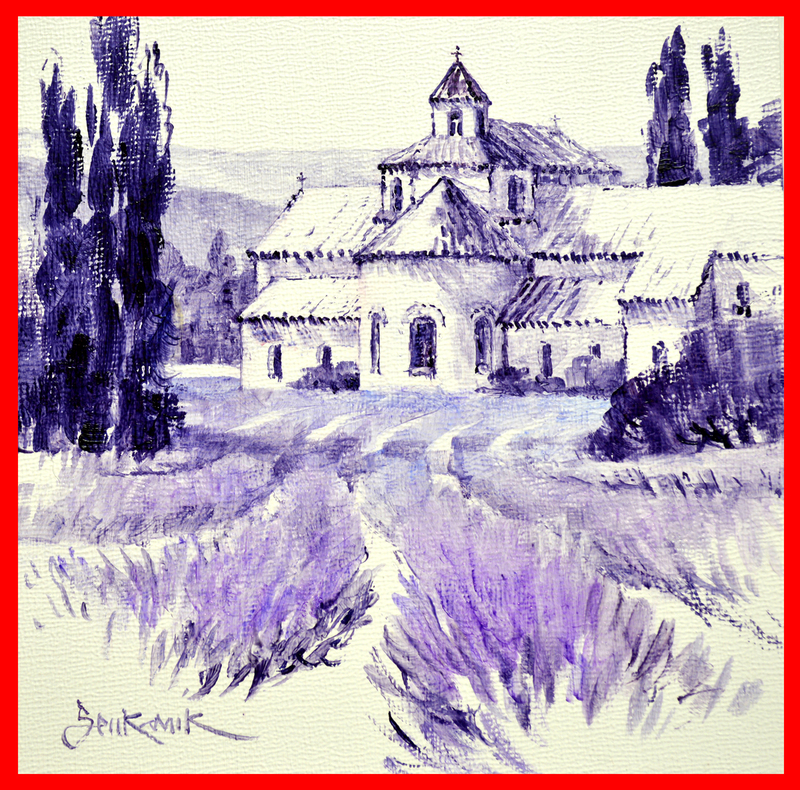 Upon seeing the majestic Senanque Abbey nestled among lush lavender fields one immediately thinks of Provence! Working on this Vignette Drawing I could hear the buzz of bees floating from one flower to the next, the heady fragrance of lavender filled my senses. 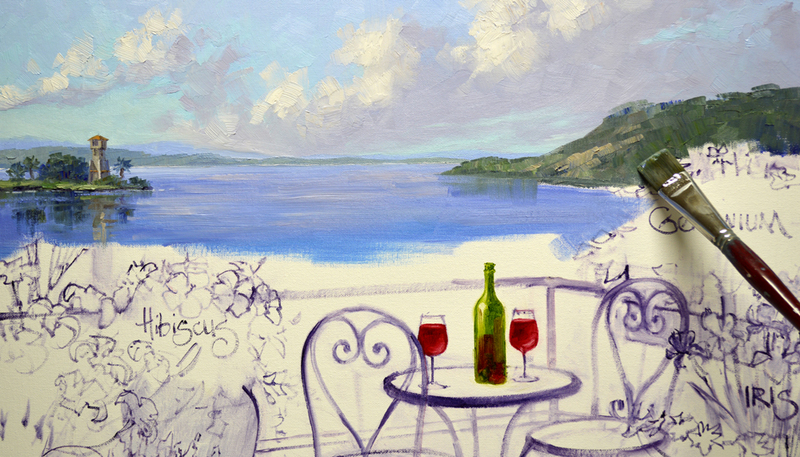 Do you have someone special in your life who loves the Southern part of France? 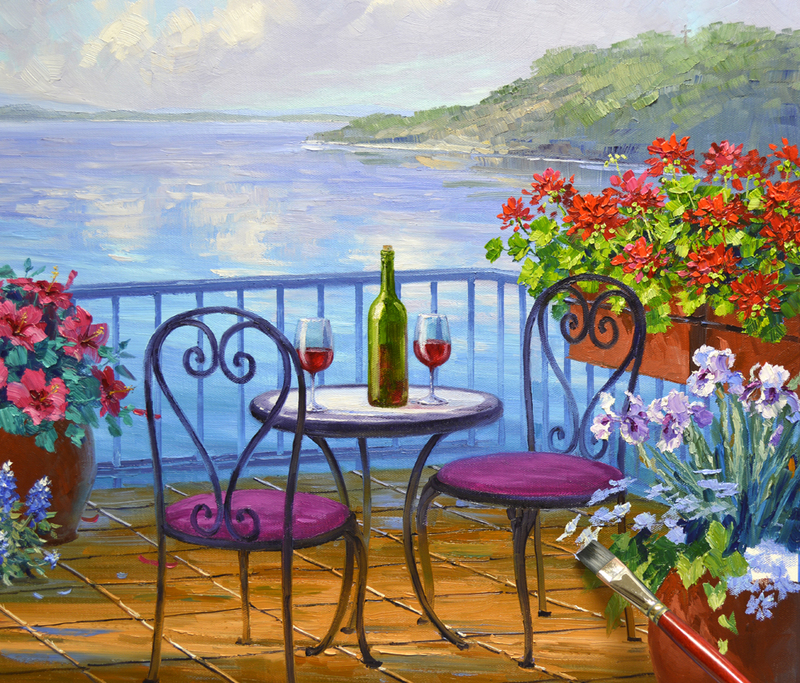 Majestic Provence would make a wonderful gift, allowing them to experience the joy of this magical region every day. 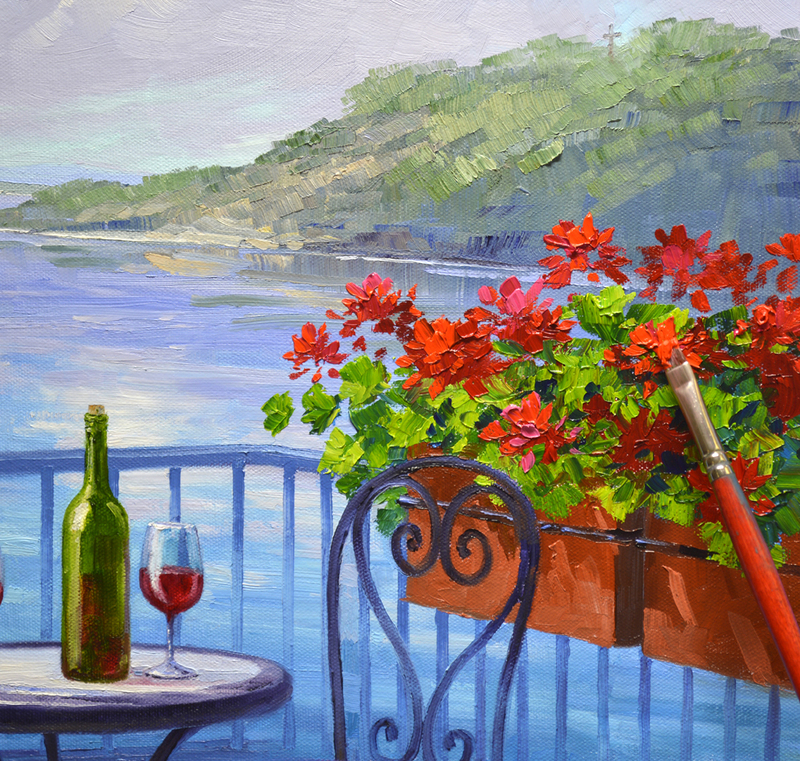 Or maybe you’d like to take a magic carpet ride to bask in the warm sunshine of Provence each time you view it on your wall. Gardening is HARD WORK! This sweet baby has been helping his pet human weed and water. Whew! Our little kitty is All Tuckered Out! Snuggled next to the old beat up watering can and a crumpled gardening glove is the perfect place for a nice snooze! Notice how the well-worn leather glove flops over the edge, onto the side of the 6 inch by 6 inch cradled panel. You can enlarge the image to see, just click on the picture. The Vignettes are designed to hang individually or as a group. 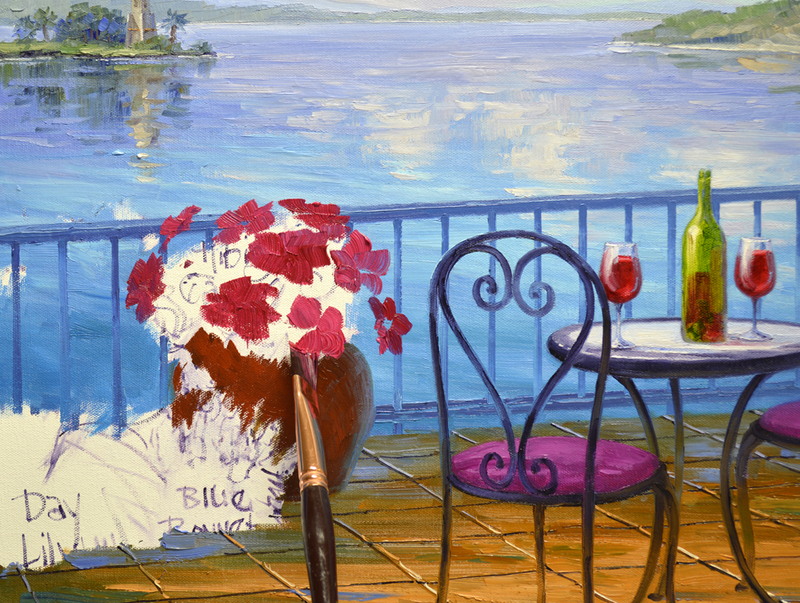 No framing is necessary and all you need is a hammer and nail to put them up on your wall! My auctions are scheduled to end 10 minutes apart so you can WIN ALL THREE! The pieces would retail for $300 each but to make it more exciting I’m starting the bid at ONLY A PENNY! That’s right 1 cent! The first auction ends on SUNDAY, April 2 at 8 PM Texas (Central) Time. Spring has certainly arrived in our garden. We always get a few Amaryllis for decoration at Christmas. Then I plant them in the garden and they reward us with delightful blooms every spring. Over the years we’ve accumulated quite a collection. I took this shot the other evening. 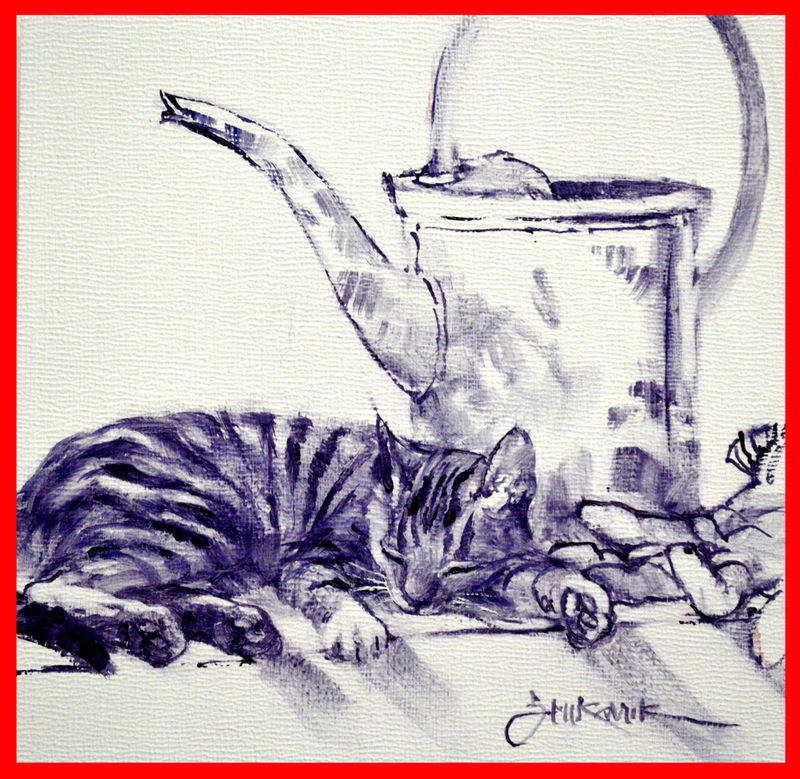 Please remember, as you read through my blog you may click on the pictures to see them larger. 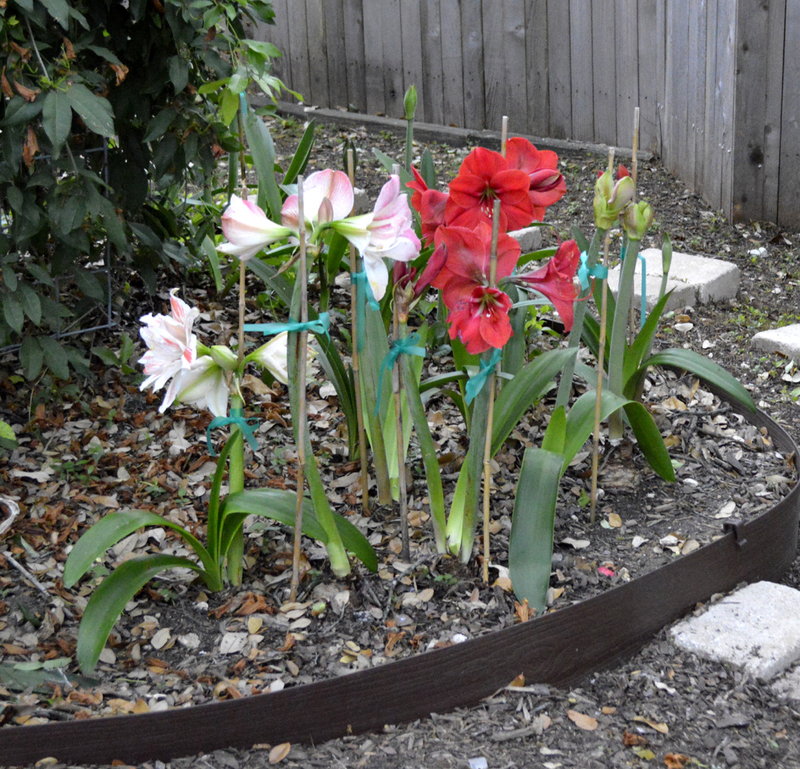 Imagine my dismay the next morning when I discovered our lovely Amaryllis flattened to the ground. I finally figured that “Percy” our resident opossum had rolled in them. That little toot! Call the Garden EMS!!!! Just as I was about to cut them all off I remembered some stakes I’d saved and stashed away in our little barn. Might as well try to save our beautiful flowers, so I tied them up to supports and so far all is good! 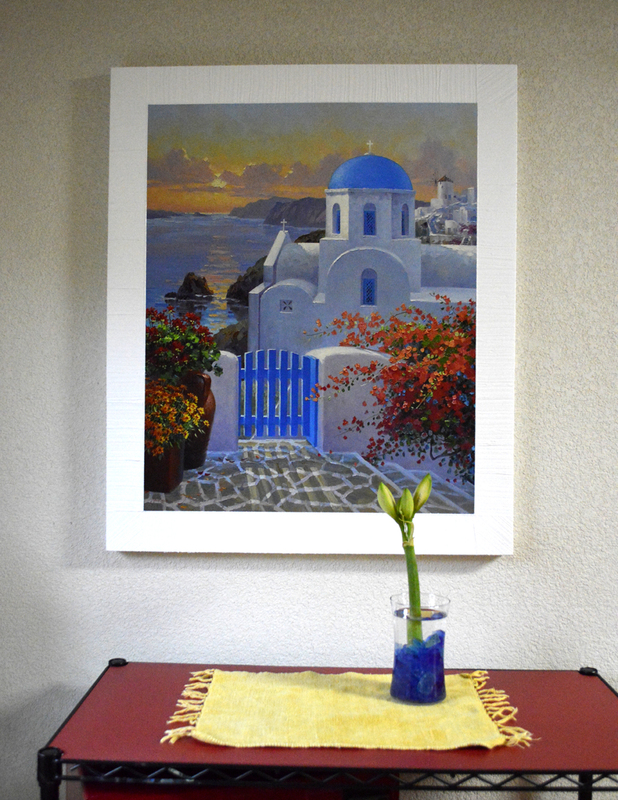 The only bloom that had broken off entirely was put in a vase in our kitchen next to one of my Limited Originals. 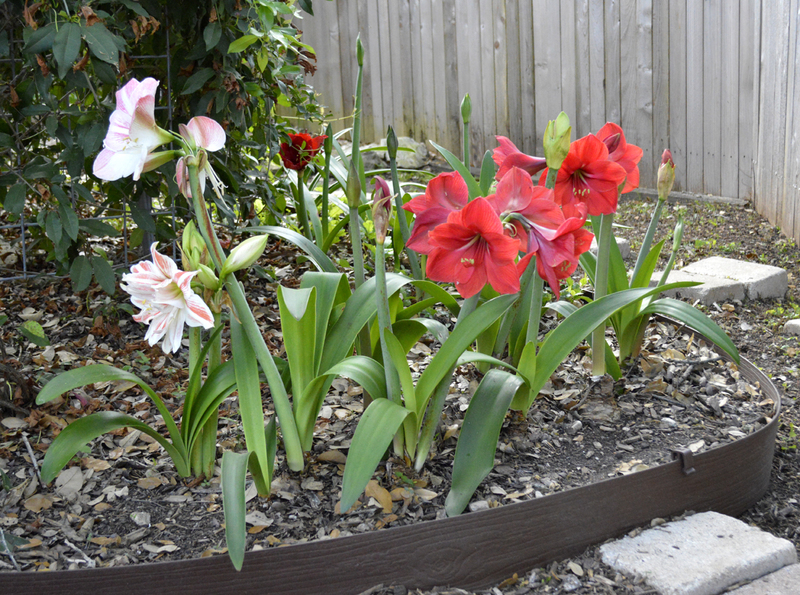 A hidden blessing, thanks to Percy I’ll be able to enjoy the beautiful Amaryllis in the house! Just a few other shots of our garden I thought you’d enjoy. Redbud trees in the back yard are beginning to burst out in purple leaves. 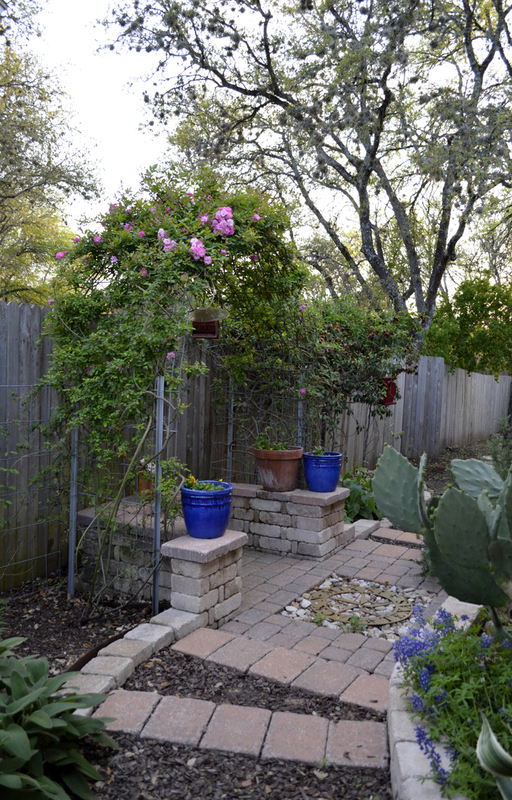 Bluebonnets and the Rose Arbor in the kitchen garden are happily beginning to bloom! 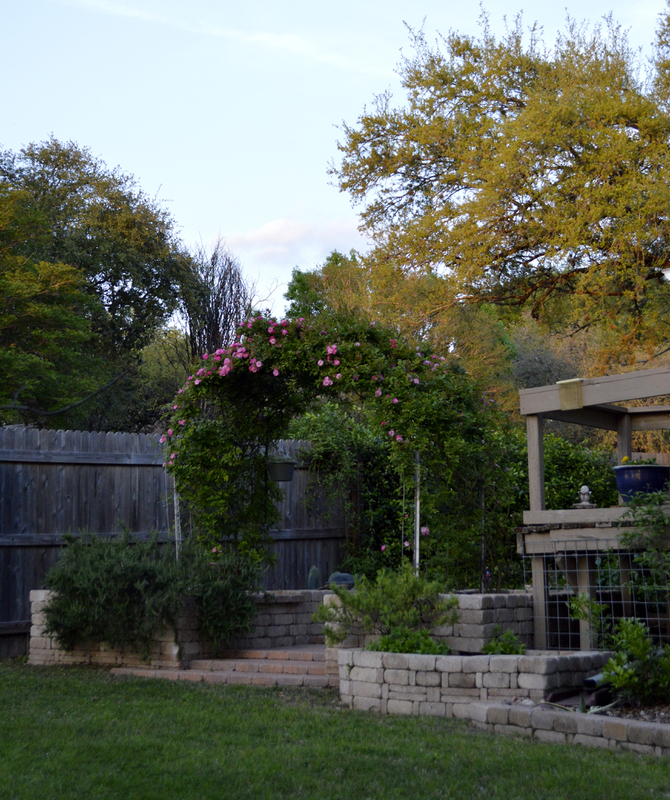 Here’s the Rose Arbor on the other side of the studio. It should be entirely covered in pink in a couple of weeks. 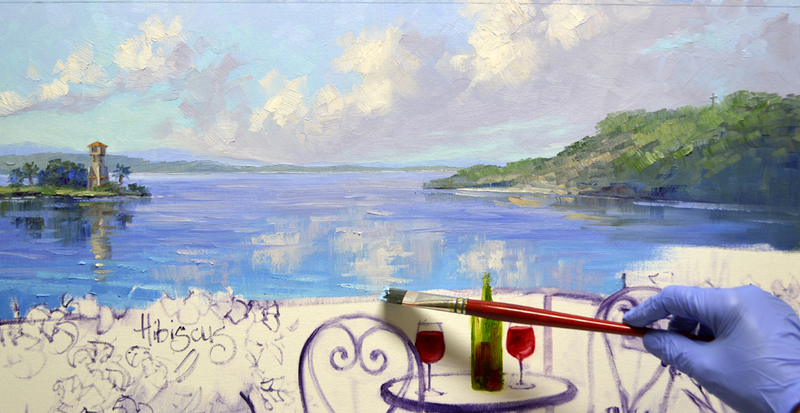 Finishing the wine bottle and glasses are my first priority today. I had blocked in the glasses with far too much wine in them. Was easy enough to go back with some of the paint I’d saved from the water and make the change. The red Geraniums POP against the soft greens in the background. 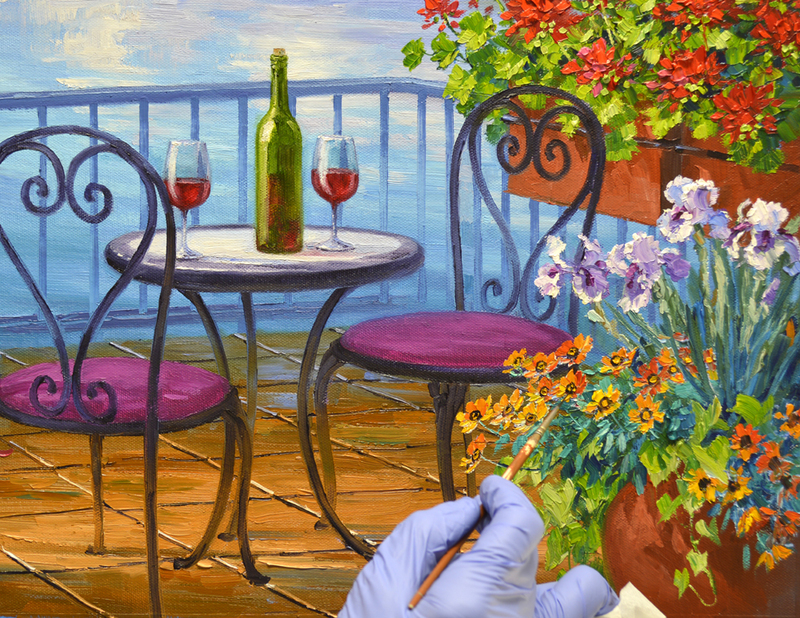 The flowers were blocked in first with combinations of Cadmium Red Deep + Alizarin Crimson and Cadmium Red Medium. The leaves are made of Pthalo Blue + Lemon Yellow. 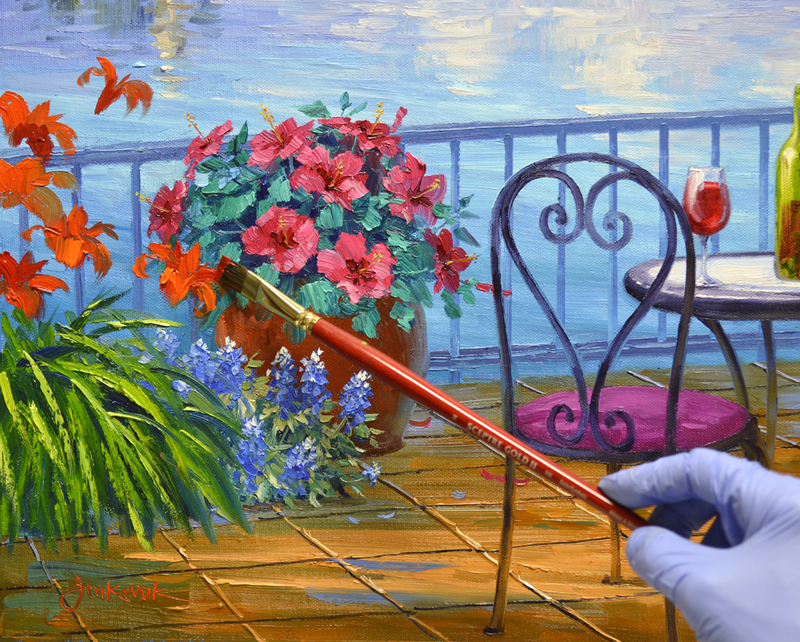 Individual petals of the Geraniums are highlighted with Cadmium Red Light and some pinks left over from the Hibiscus. Lesli remembers her grandmother growing Irises with deep purple throats. Like with the Day Lilies, I’ve painted the foliage of the Iris first. 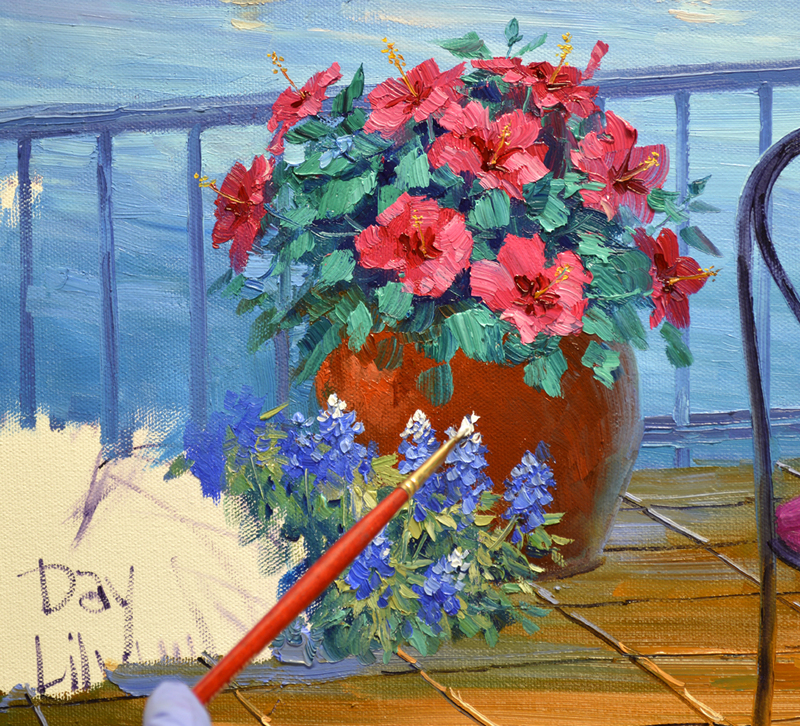 Then the lacy flowers are added by carefully “laying” the thick brush strokes of color on top of the background. Sweet Potato Vine cascades out of the container, the heart shaped leaves bring a romantic touch. 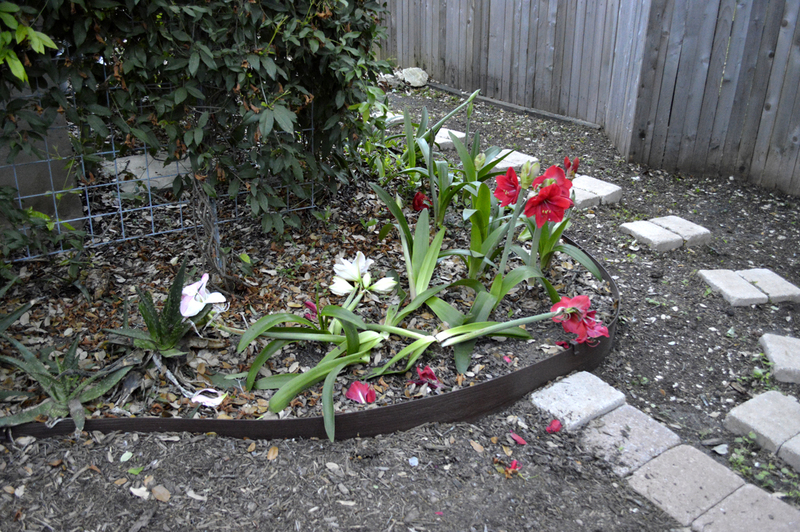 We had originally planned to have White Daisies planted with the Irises and Vine. 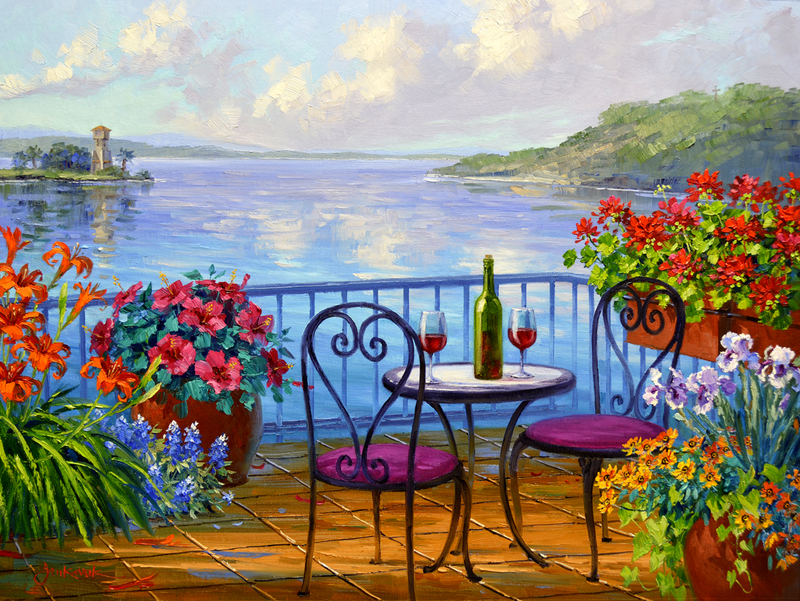 But when I began blocking the flowers in I realized the White would totally take away from the clouds reflecting in the water. The painting wouldn’t be nearly as dramatic. 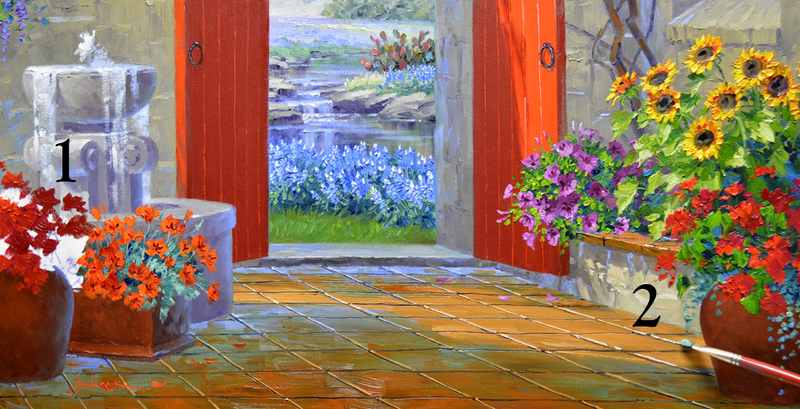 I immediately make an executive decision to paint the Daisies with rusty red oranges and deep yellow oranges. I’ve added Cadmium Yellow Deep to some of the color mixes remaining from the Day Lilies. The centers are delineated in three steps. #1. A dark oval is placed with a mix of MUD + Liquin. #2. A dot of Cadmium Yellow Deep is then made, leaving enough dark to encircle the yellow. #3. A speck of the MUD + Liquin is pinpointed in the middle of the yellow! You can see this better if you’ll enlarge the picture, just click on the image. 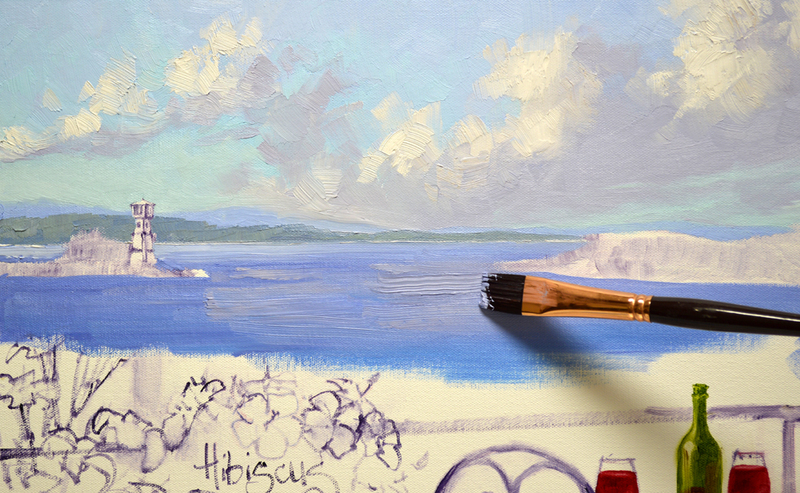 A new experience for me today, painting Hibiscus! The fragile blossoms are blocked in with mixes of Permanent Rose + Alizarin Crimson and Permanent Rose + White following my usual sequence of Flowers First, Leaves Last. There is method to my madness! I begin with the blooms so their color will remain bright and crisp when the leaves are painted. 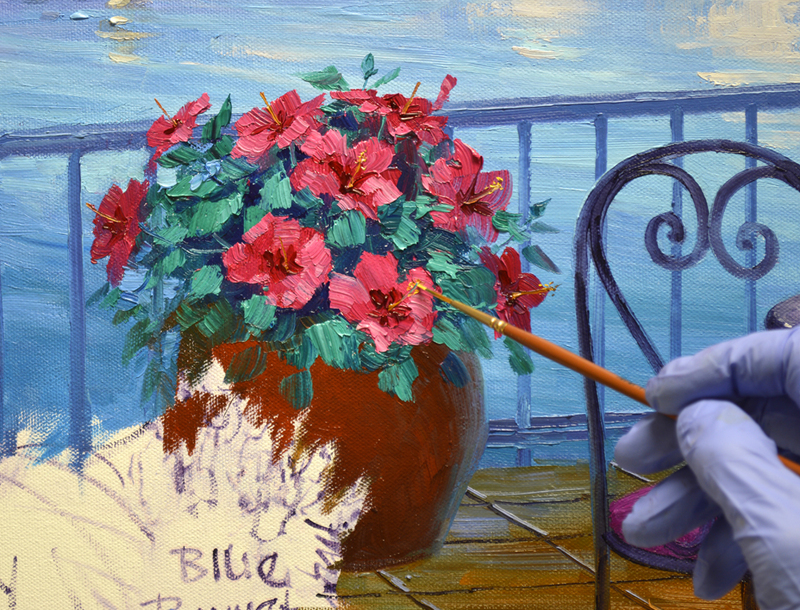 If the foliage was done first my brush would pick up some of the green as I blocked in the flowers, dirtying their brilliant color. The leaves are painted next. I use mixes in several combinations of Viridian Green + Pthalo Blue + White. After making the deep, dark centers with Alizarin Crimson + Liquin the yellow stamens are delineated. 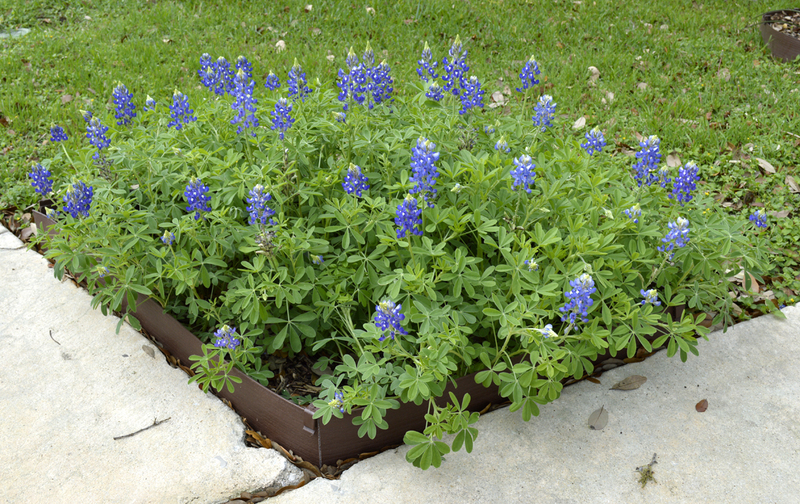 The same method is used for the Cobalt Bluebonnets nestled at the base of the Hibiscus container. White “bonnets” finish out our Texas State Flower. Jack and I discovered an interesting fact when we lived in the Hill Country south of San Antonio. The native Bluebonnets growing there DON’T have the little white caps! Here’s a field near where we lived. You can enlarge the image by clicking on the picture. Look closely……No Bonnets. 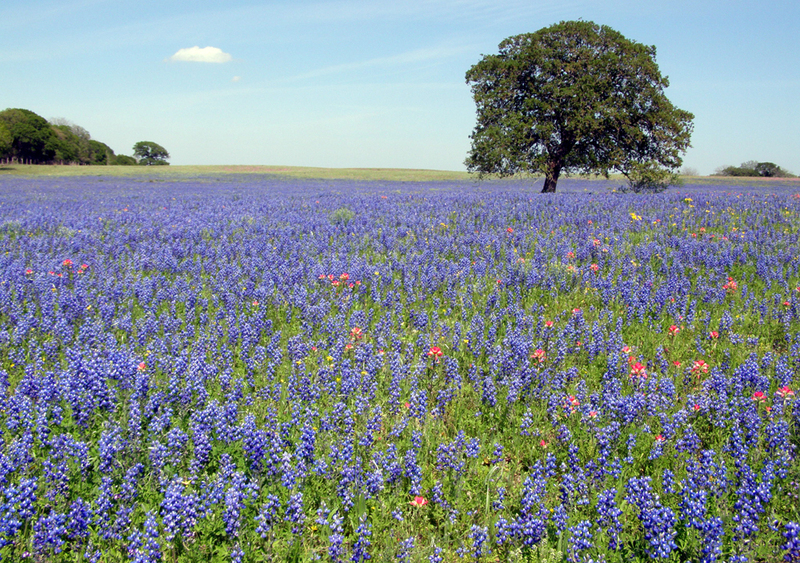 The Bluebonnets along the roadsides have the white tops because they’ve been seeded by the Highway Department. But the native ones are different! 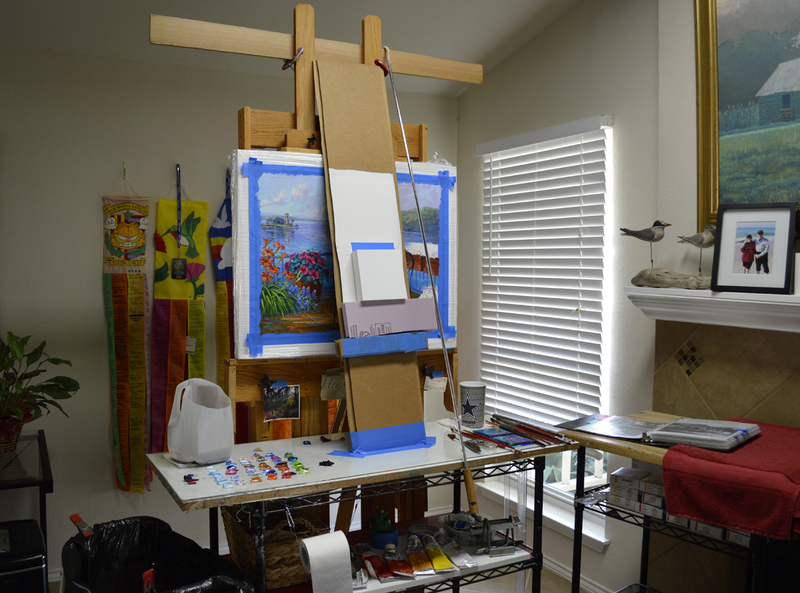 The sequence is reversed when painting the Day Lilies, the long strap-like leaves are blocked in first. The blossoms are blocked in second because they don’t “Clump” down, with a lot of foliage surrounding them. Most of the flowers made of Cadmium Orange + Alizarin Crimson and Cadmium Orange + Cadmium Red Light, dance above the leaves. But I still have to careful because the water behind them isn’t dry. 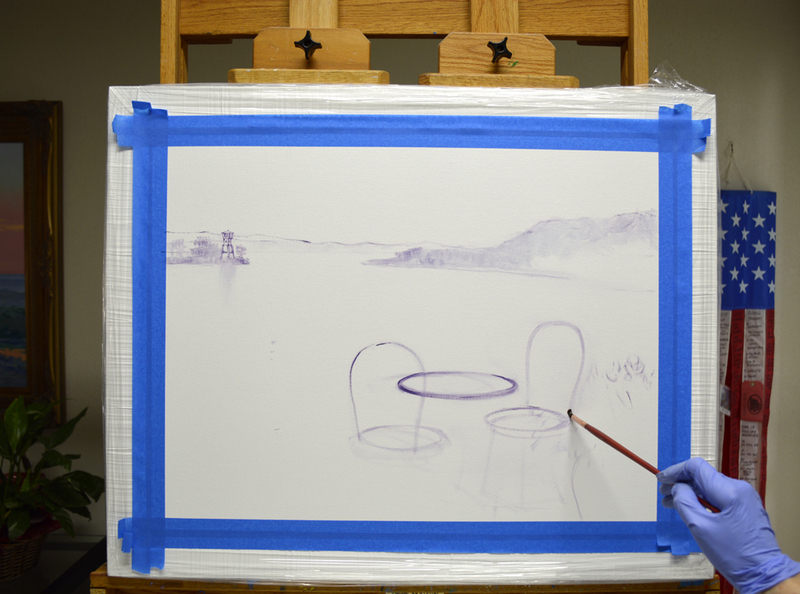 I lightly “Lay” the bright color on top of the underlying wet paint. That way I don’t muddy the Day Lilies. This is also the case where the flower comes in front of the Hibiscus leaves. Today we’re laying tile on the deck. 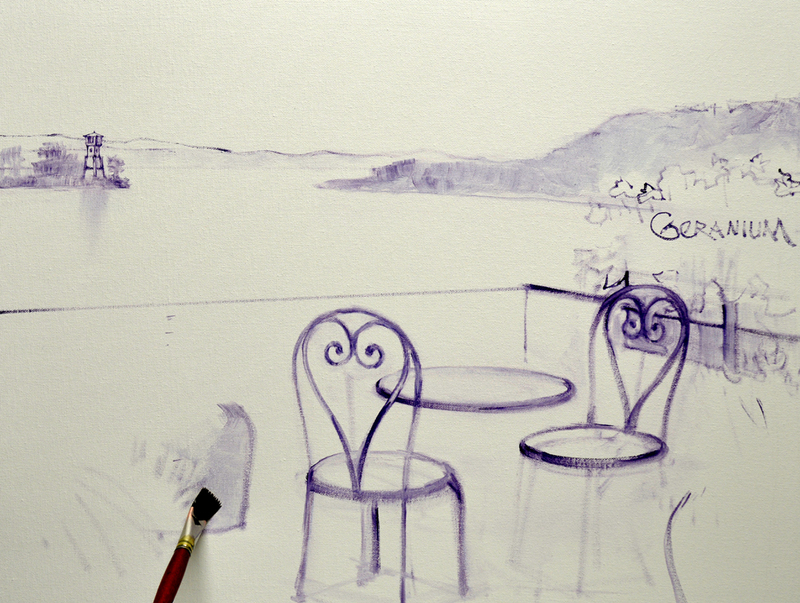 But before we begin the heavy work I draw the heart shaped backs of the wrought iron chairs into the wet paint of the water behind them. The dark shadows are first established, leaving white canvas where sunlight will stream across the floor. After the sun warmed portion of the satillo tile deck is painted, perspective lines are carefully pulled into the wet paint. I can’t use the mahl stick here. It would limit the movement of my arm and hand, making it impossible to draw straight lines. Next horizontal crevices separating the tiles are delineated. We’re back at the lake on this St. Patrick’s Day. How appropriate, I’m painting green! The distance point on the right is actually populated by several homes and condominiums. 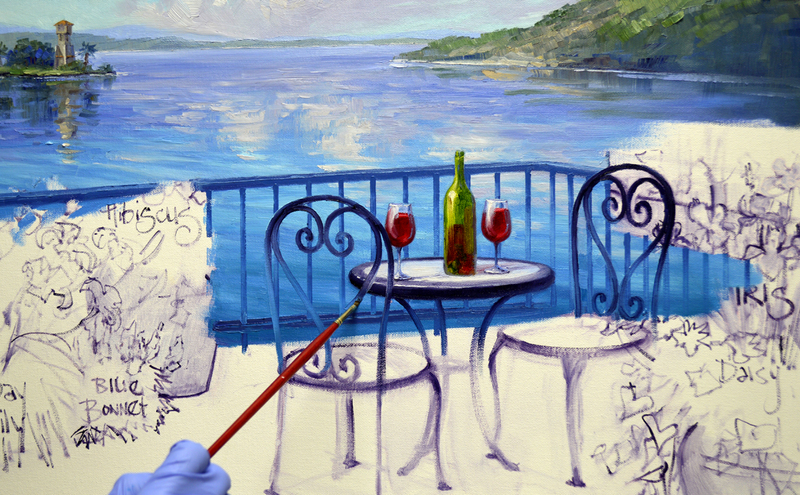 But…that’s the joy of painting, we’ll give Lelsi and Mike a private lake all of their own. 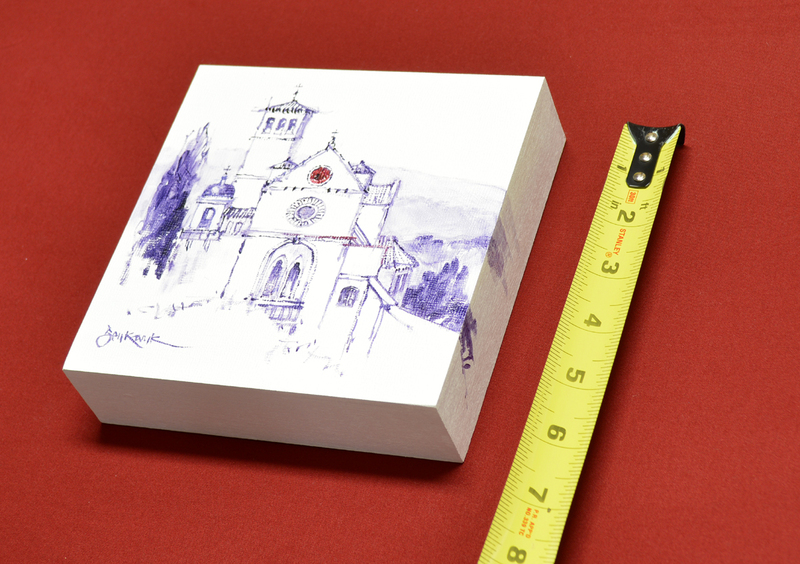 The one element we’re going to add is a huge cross where St. Paul the Apostle Church is. The Sanctuary buildings are hidden from view by the trees. Now, highlights reflecting from the clouds above are brought down into the water. 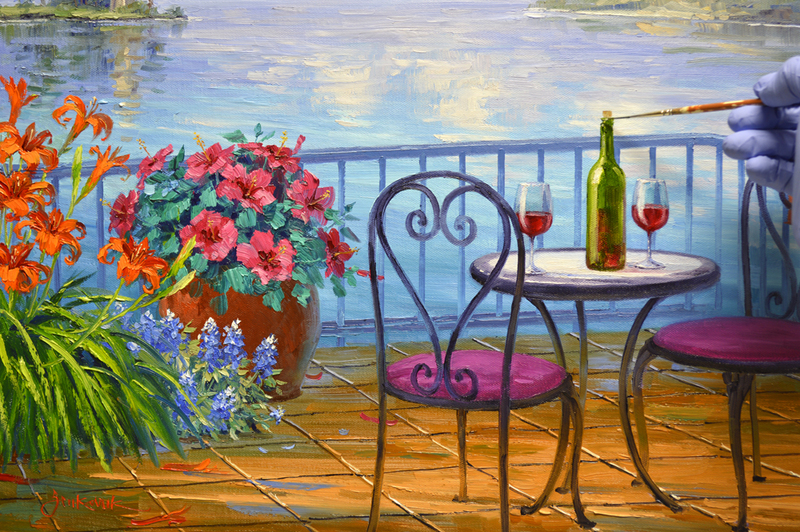 We continue blocking in the water underneath the railing, carefully working around flower pots, chairs, table, glasses and bottle of wine. 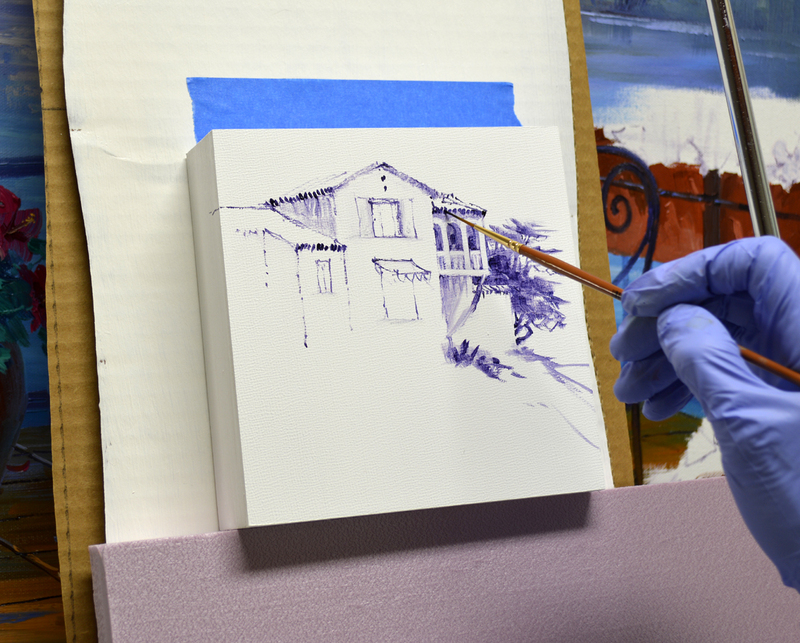 Using my T-Square hooked over the top of the canvas I draw the uprights of the railing into the wet paint of the water behind. 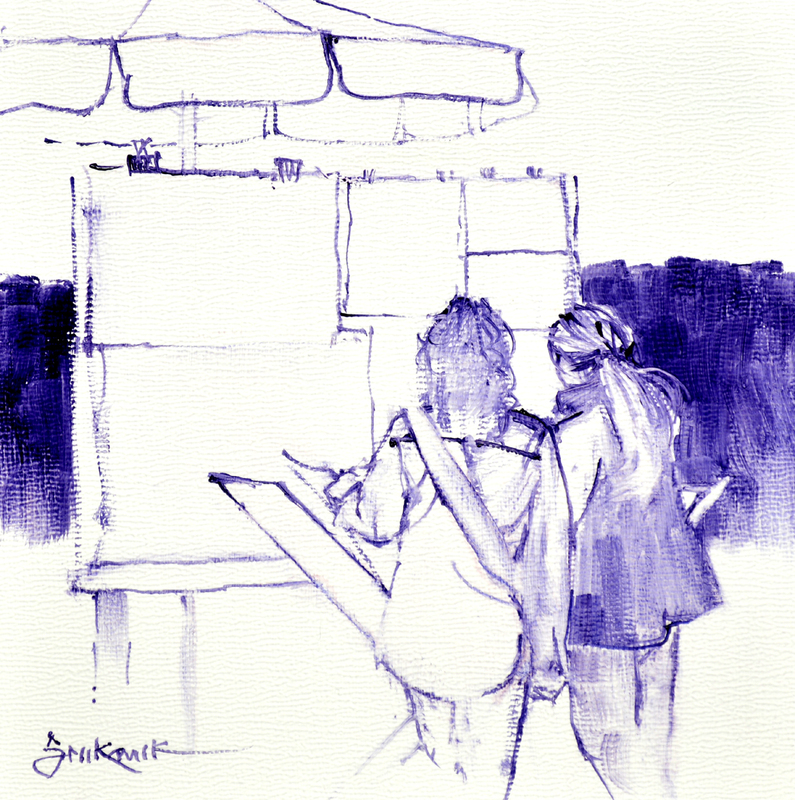 This piece is framed in our White Senkarik Signature Frame, so I can easily use the T-Square with worrying about the edge of the canvas having wet paint. 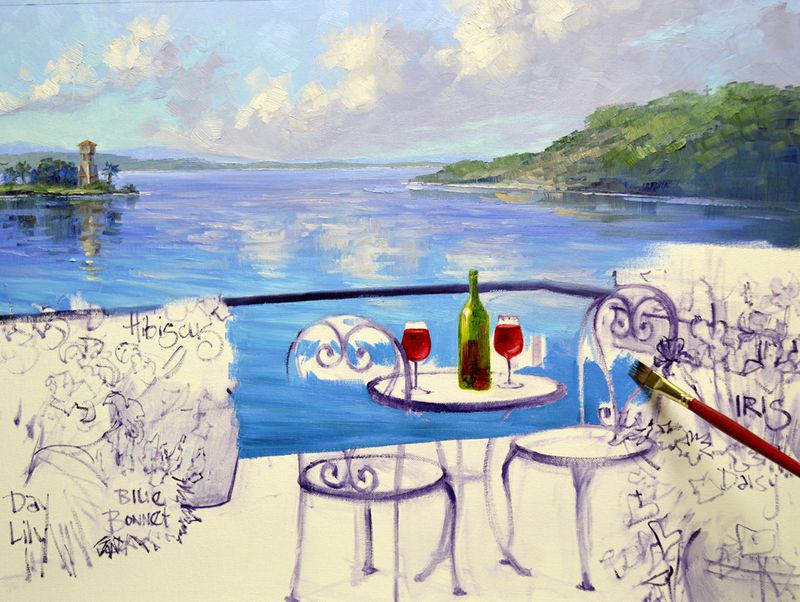 This wouldn’t work if the piece was painted around the sides of the canvas, I’d have to delineate the rails freehand! WHEW! The railing is done. We’ll tackle the table, chairs and floor in our next session. 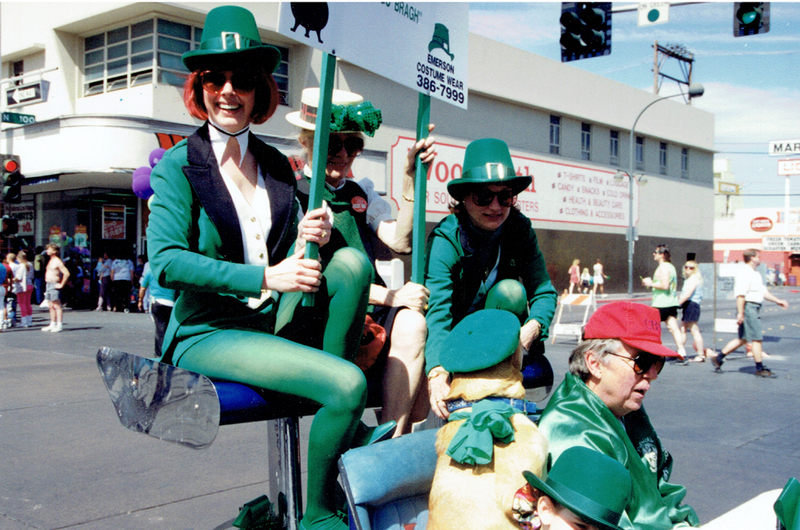 But before I go I have some fun St. Patrick’s memories to share with you. 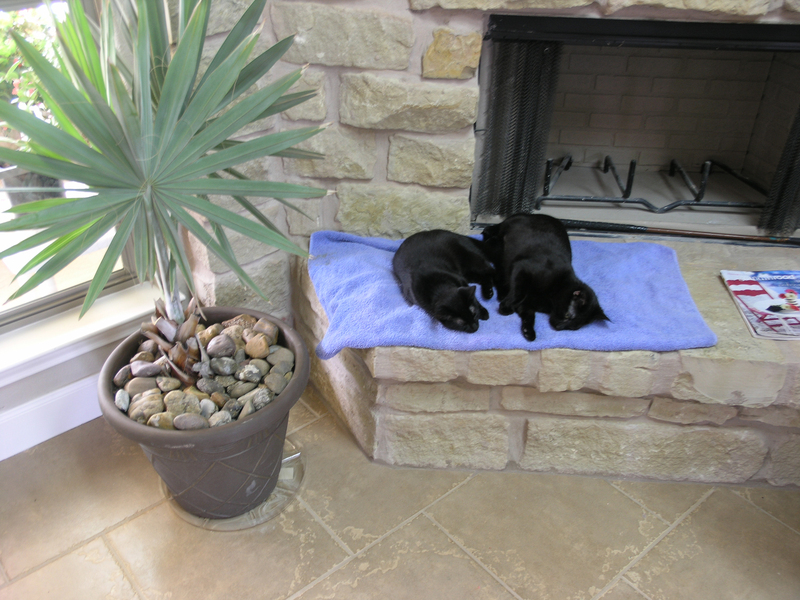 Jack and I rescued Molly and Sissie from the shelter on March 17, 2011! So today is their 6th anniversary with us. This picture was taken just a few days after we got them home. What fun they’ve been and a huge comfort to me this past several months. 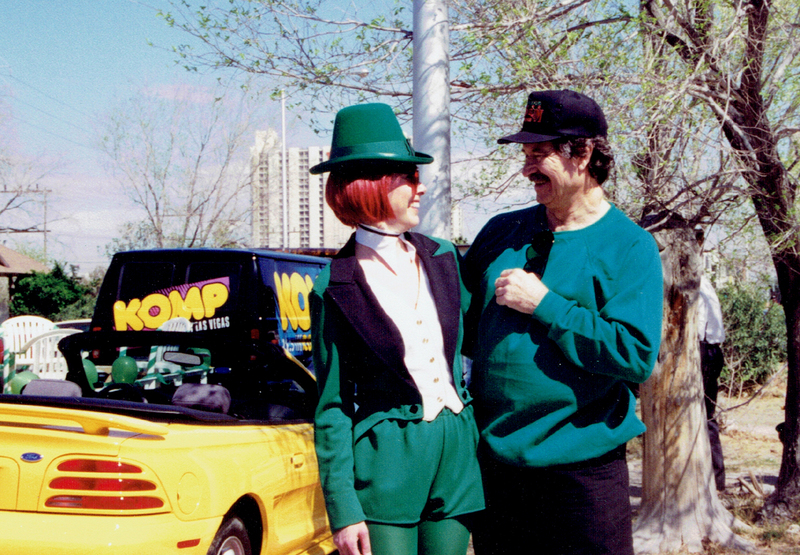 We lived in Las Vegas in 1994 and met a couple who became dear friends, Lola and Dave Wagonvoord. They owned KLAV, a radio station there. 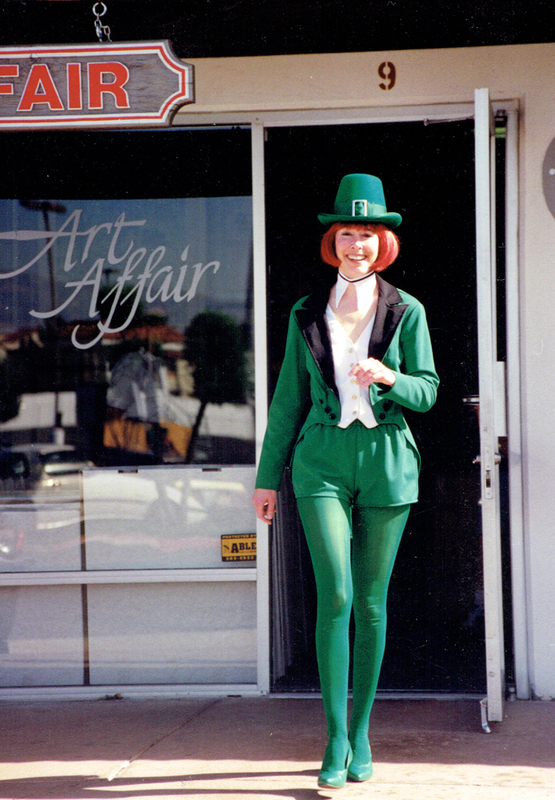 A few days before St. Patrick’s Lola called and said, “Meet me at the costume shop, we’re going to be in the parade!” So we got outfitted as leprechauns. We rode on the back airfoil of Dave’s race car, that’s him driving. Jack walked the whole route taking photos. I think he got the toughest part of the deal, but at least it wasn’t too hot! Later we discovered that was the very last parade down Fremont Street before it was closed off for the “Fremont Street Experience”! So we were history making leprechauns! On the way home Jack and I stopped at Art Affair, a gallery that had commissioned him to do a series of golf course paintings. Jack said, “Go in and wish Ron a Happy St. Patrick’s Day. See if he recognizes you!” So I did. I was laughing as I came out….Ron never did figure out who the leprechaun was that came and gave him a hug. A week later Jack was meeting with him and Ron told him about his St. Patrick’s mystery. Jack about fell out of his chair laughing! Then he revealed the secret. Have to admit, it was fun being a red headed leprechaun for a day! 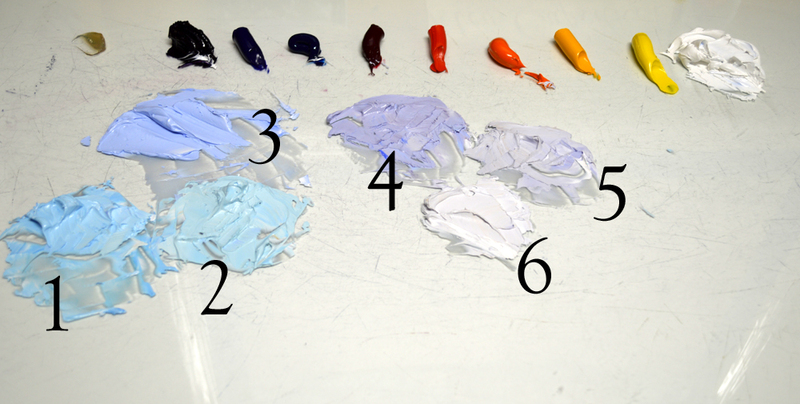 Colors are mixed and we’re all ready to paint those cottony clouds floating across the summer sky. #1. White + Pthalo Blue. #2. White + Pthalo Blue + a tiny bit of Cadmium Orange. AND I do mean just a tad. #3. White + Cobalt Blue. #4. MUD (Ultramarine Blue + Alizarin Crimson) + White. #5. Mix #4 + White. #6. Mixture #5 + a touch of Cadmium Orange + White. If you would like to learn more about our Double Primary Color Mixing System that Jack developed CLICK HERE. The blue field of the sky is painted first. The uppermost region is blocked in with mix #3. The middle area is #1 and the portion of the sky nearest the horizon is the lightest mixture, #2. 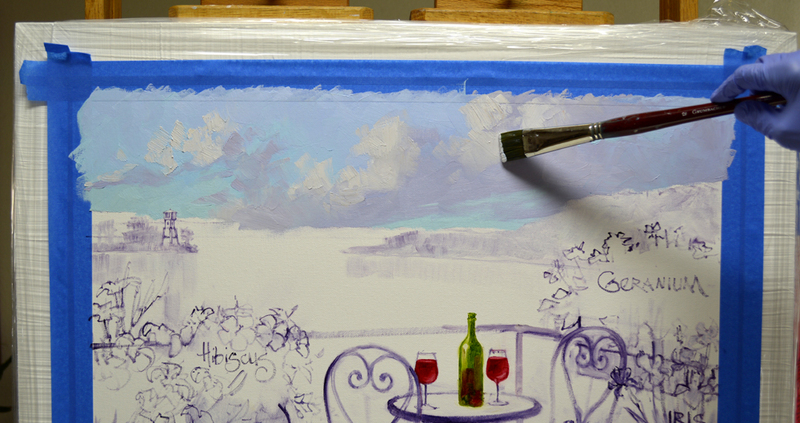 The places where I’m going to have the clouds are left unpainted. This way it’s easier to determine their design in the sky. The shadows of the clouds are made with mix #4. The dark extends into the blue which is still wet. This gives the edges a feathery softness. Highlights are added with mixtures #5 and #6, making sure the edges are kept fluffy so the clouds will recede. The rolling hills of the Texas Hill Country line the lake. 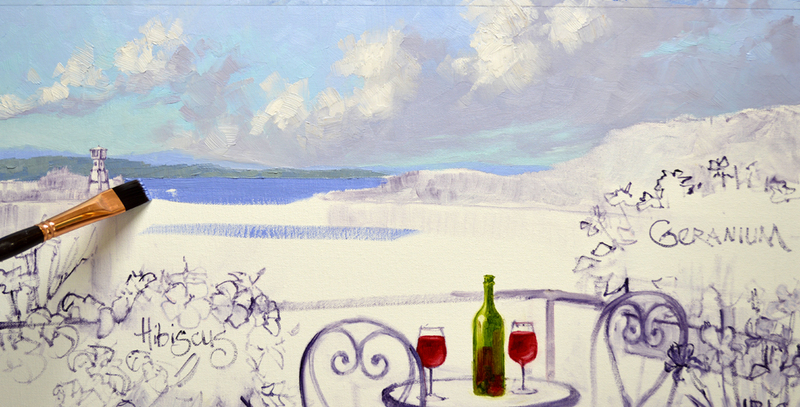 A combination of MUD + Ultramarine Blue + White is used for the water along the horizon. Some of mixture #4 is brushed into the water to give the impression of cloud reflections. We’re beginning on a new collaboration today. 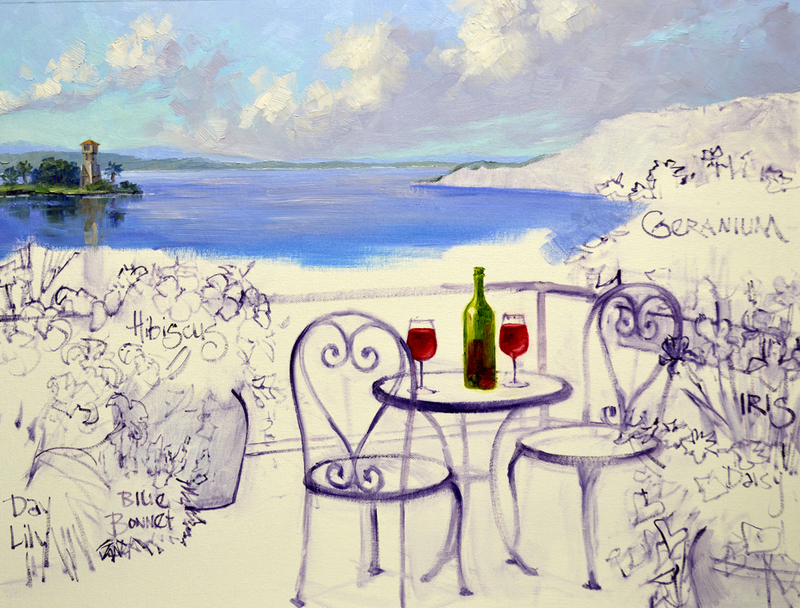 My collectors have a vacation home in Horseshoe Bay, Texas. 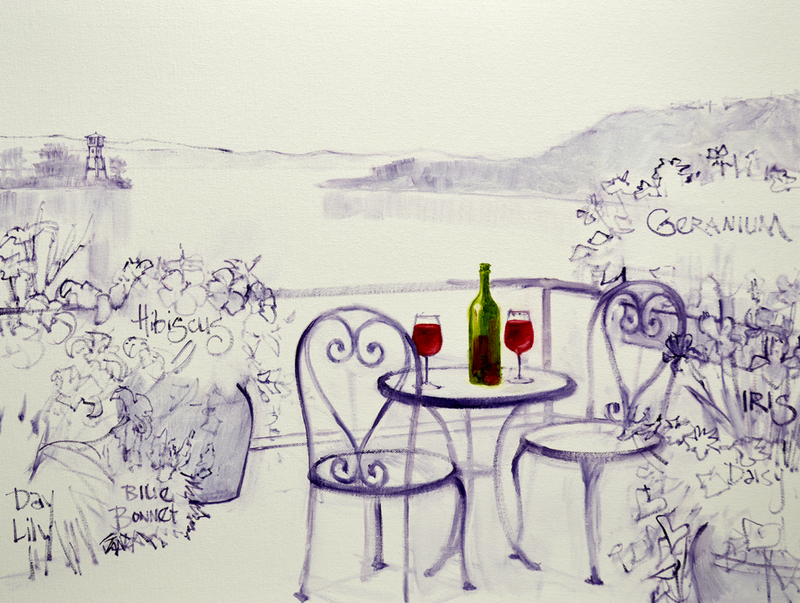 Lesli would like to be able to enjoy the view from the deck at the lake house every day in their “city” home. After she pondered the sketch and we visiting a bit Lesli decided to change the flowers to some more colorful, Texas natives. As she said, “I feel like I’m a zone 8 plant and just don’t do well in the cold. 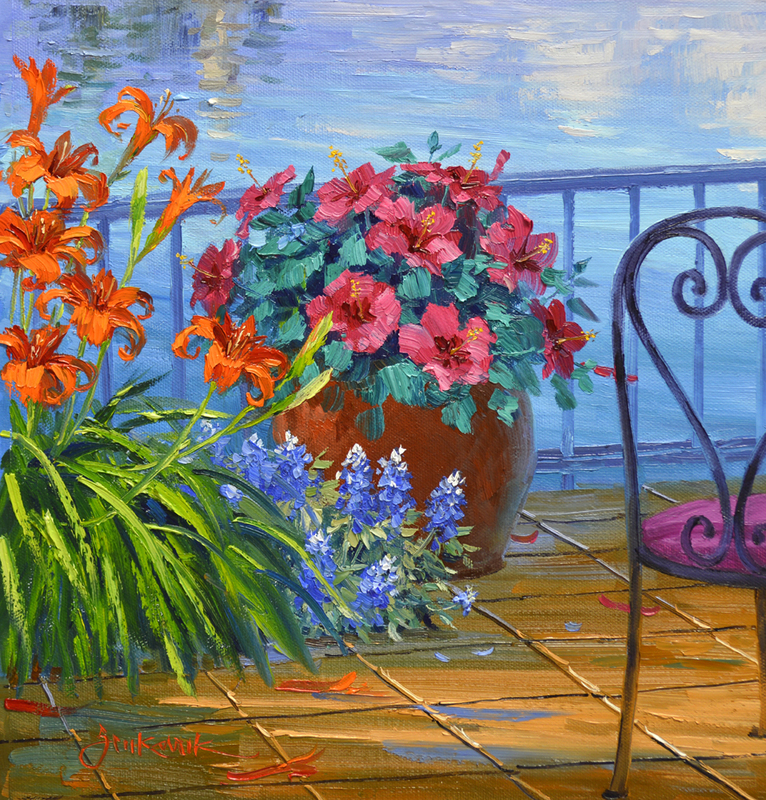 I’d like the flowers on our deck to be the same.” Lesli remembers her grandmother’s Day Lilies and Irises, so we’ll definitely add them. 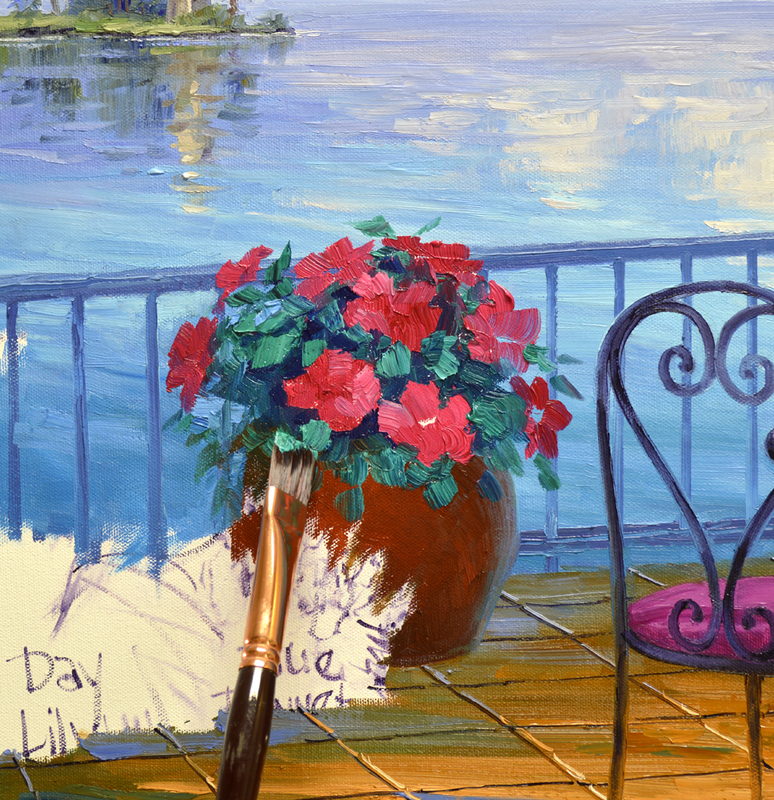 The new flower selections are penciled in on the original sketch. You may click on the picture to enlarge the image. The horizon line is established first, then the back ground hills, point and lighthouse are drawn. 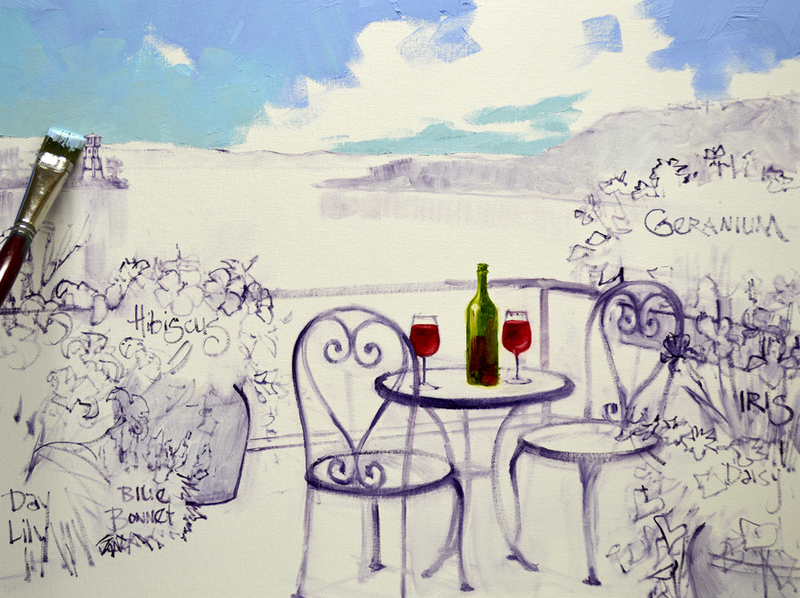 Moving to the foreground I begin developing the bistro table and chairs. 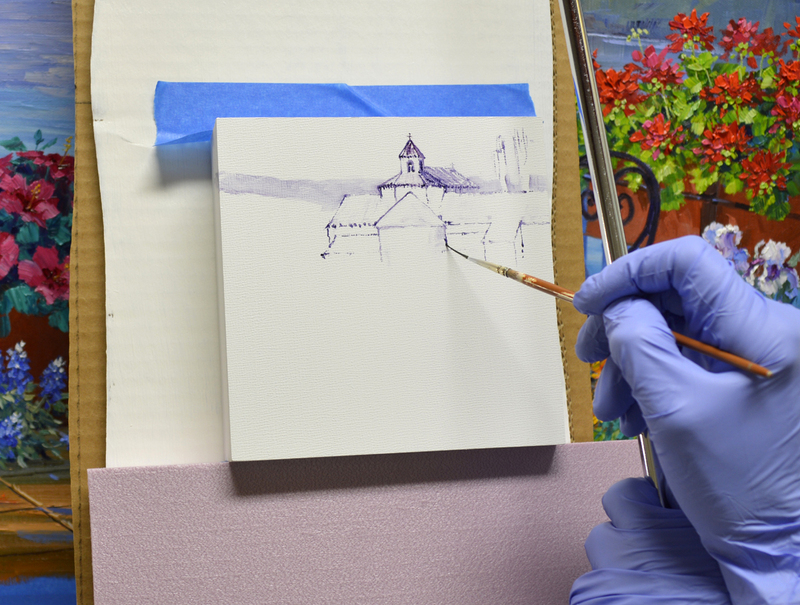 All of the sketch is done with a brush dipped in a thin oil wash of MUD (Ultramarine Blue + Alizarin Crimson) + Liquin. 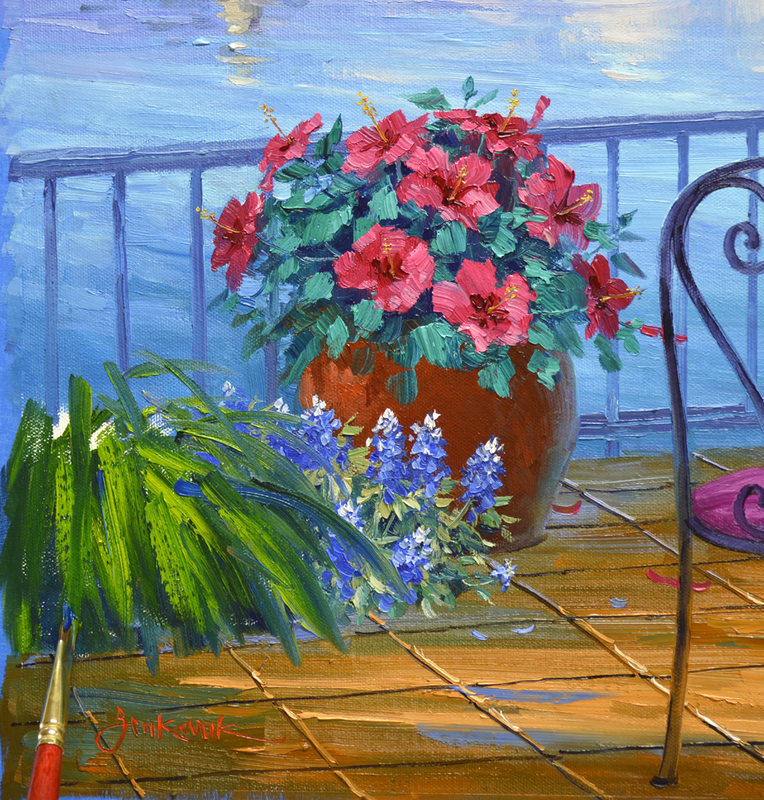 Once I have the perspective of the the heart backed wrought iron chairs correct, containers full of Geraniums are added. 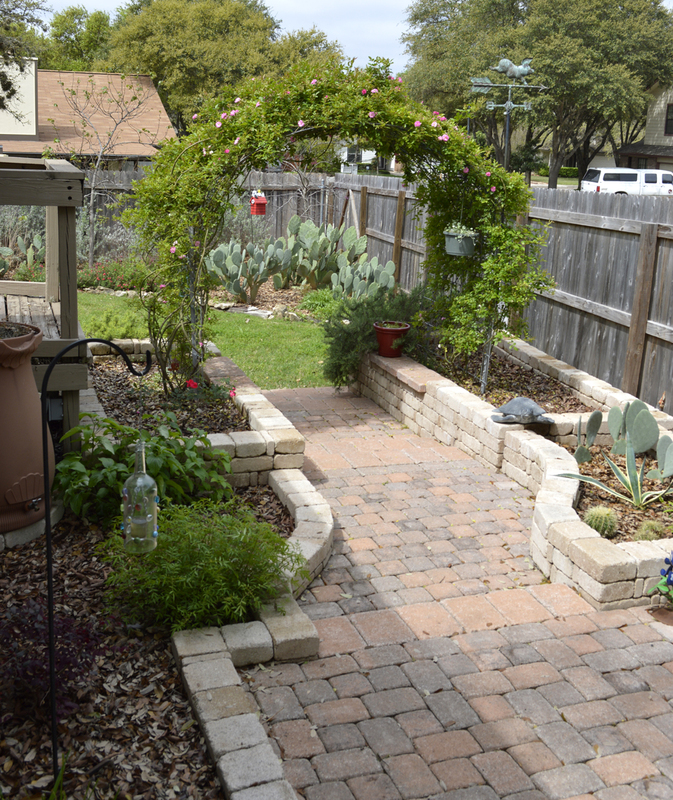 Another terra cotta pot will be at the edge of the deck. 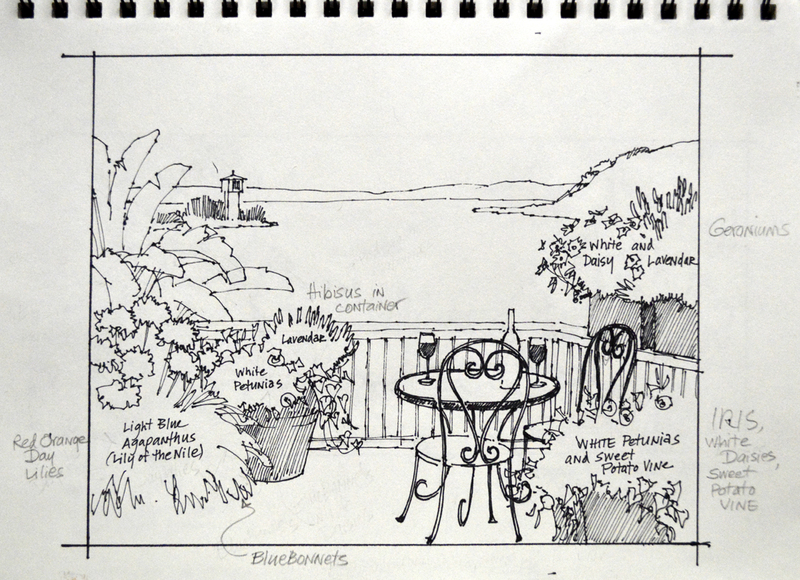 Day Lilies, Bluebonnets and Hibiscus are sketched in and labeled to remind me of our gardening plan. 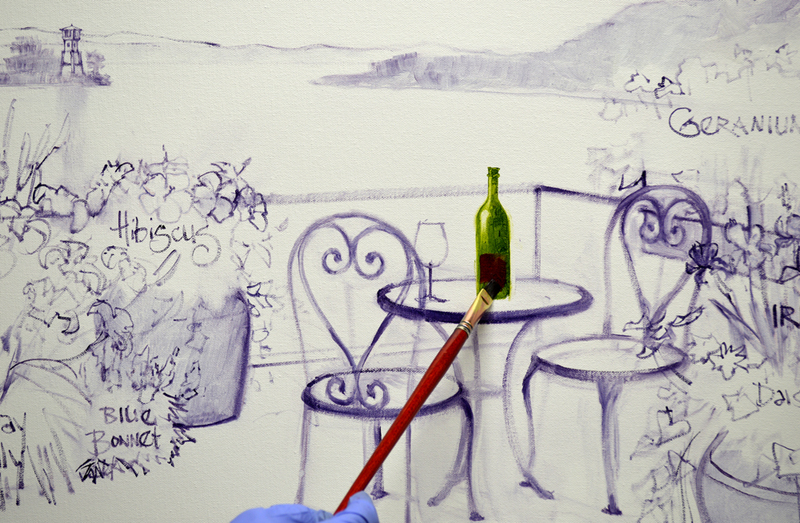 The wine bottle is washed in with a thin mix of Sap Green + Liquin. 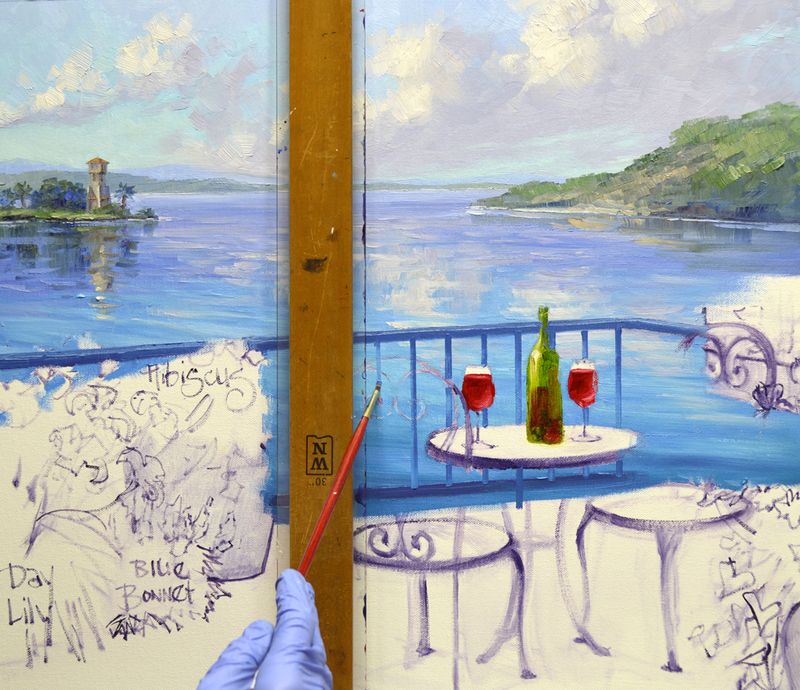 Alizarin Crimson + Liquin is washed over the green in the lower part of the bottle, indicating some wine is left. Wine glasses are filled, table legs made and we’re done for the day. I’m going to wait to do the uprights on the deck railing. They will be done when the water behind the railing is painted. If you would like to receive an email every time I publish a new post please feel free to subscribe to my blog. CLICK THIS LINK and scroll to the upper right side of the page. You will see a heading EMAIL SUBSCRIPTIONS. Just enter your email address and click the button “Sign me up!” It’s easy. And if you enjoy my blog please CLICK the FaceBook LIKE Button. As we say in Texas, “Much Obliged! 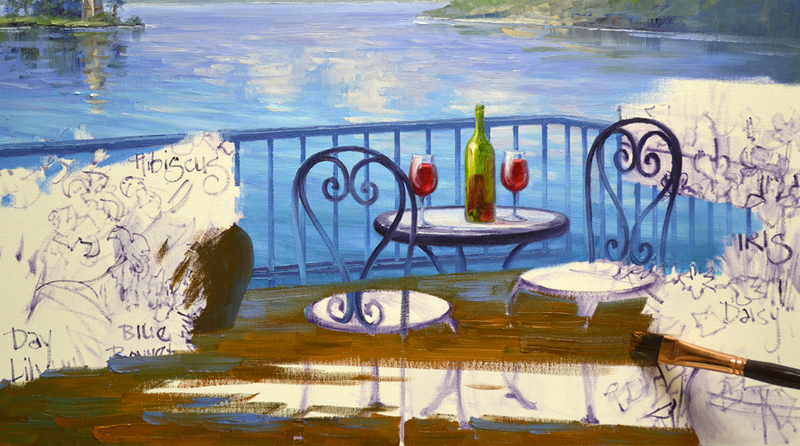 VIGNETTES: Visual Melodies from My Heart is a new series of art pieces I’m doing exclusively for my eBay collectors. 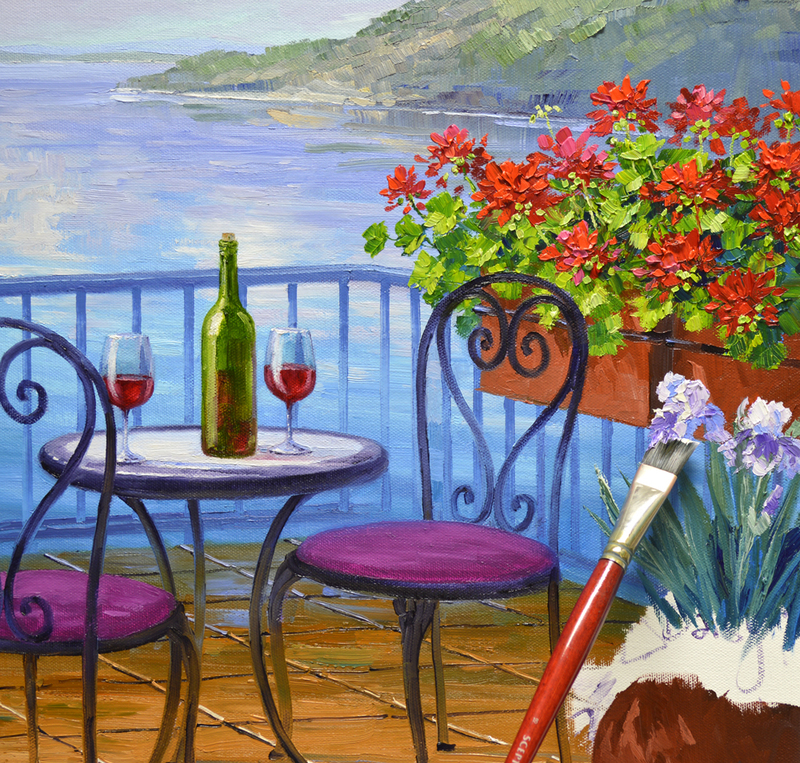 I can’t carry a tune in a bucket but my paintbrush dances to the melodies of memories, playing in my heart. 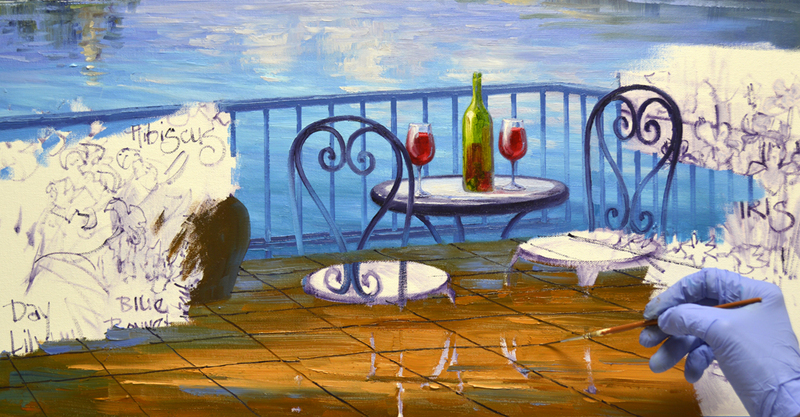 A vignette is a brief but inviting scene that leaves you wanting to experience more. These Original Oil Wash Vignette Drawings, based on sketches I made as Jack and I traveled the world, spill from the front of the canvas panel onto the sides. 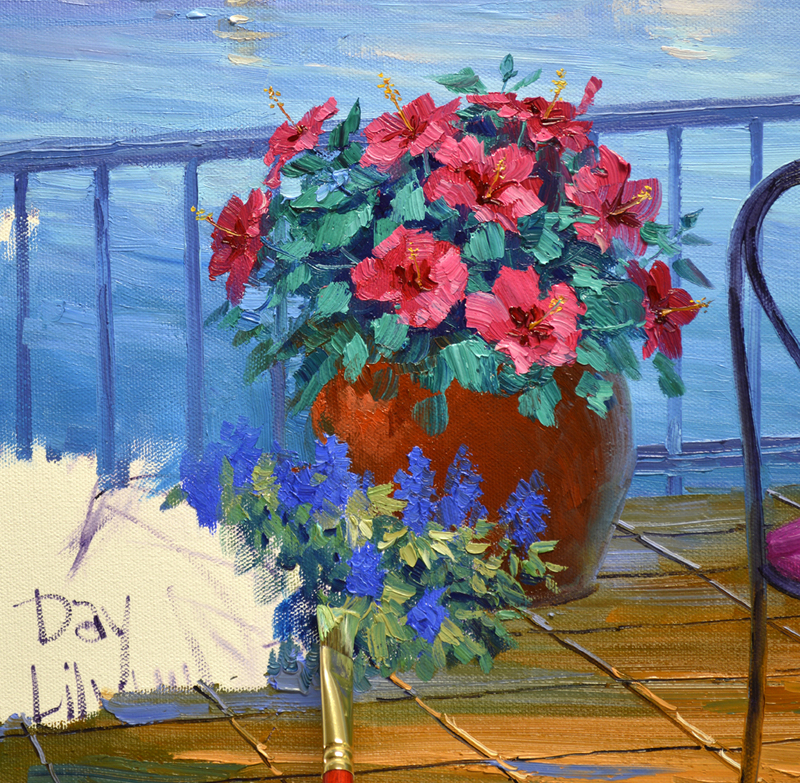 Enjoy the delight and excitement of the visual melodies singing from my brush, every time you view them in your home or office. The cathedral of Assisi is amazing! It’s difficult to imagine such intricate stonework was made by craftsmen without the assistance of today’s computers and cranes. We are so fortunate these beautiful old buildings have withstood the ravages of time; giving us a glimpse of elegance from hundreds of years ago. Please remember, if you’d like to enlarge any of the images to see them more clearly, just click on the picture. 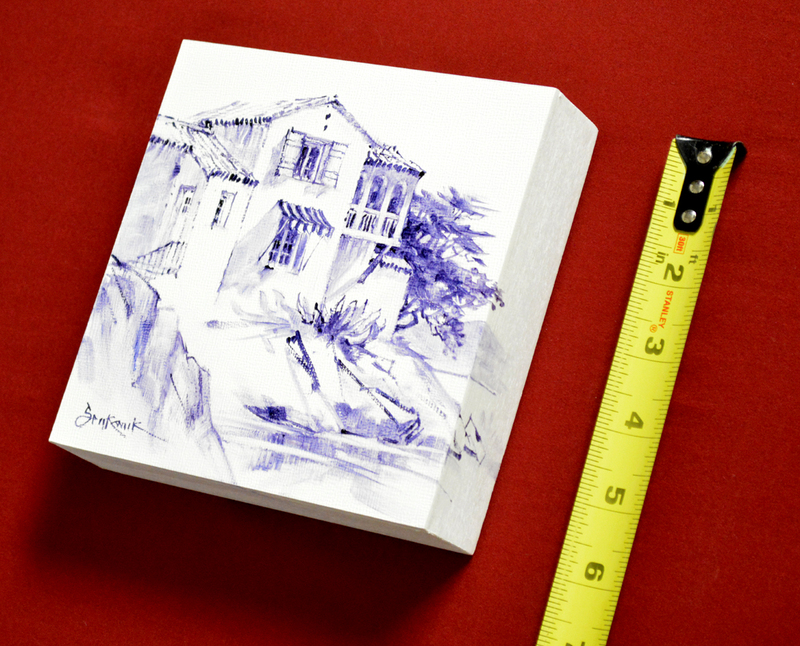 All of these Vignettes measure 6 inches by 6 inches. And…..the bidding starts at ONLY A PENNY! 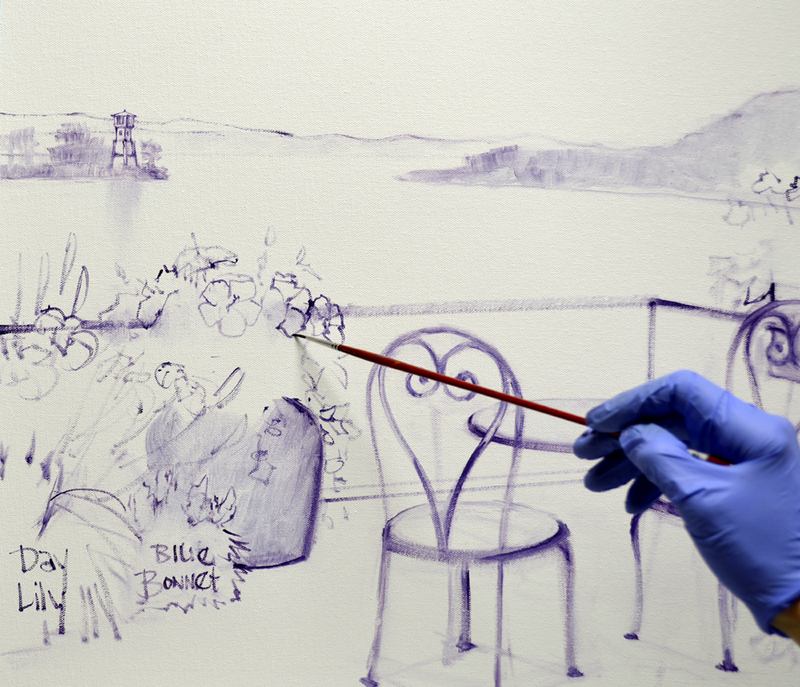 Notice how the Oil Wash drawing continues over the edge, onto the side of the Cradled Panel. And you don’t have to worry about doing any framing! Each one already has the hanging wire attached. All you need is a hammer and nail! Barcelona, Spain! 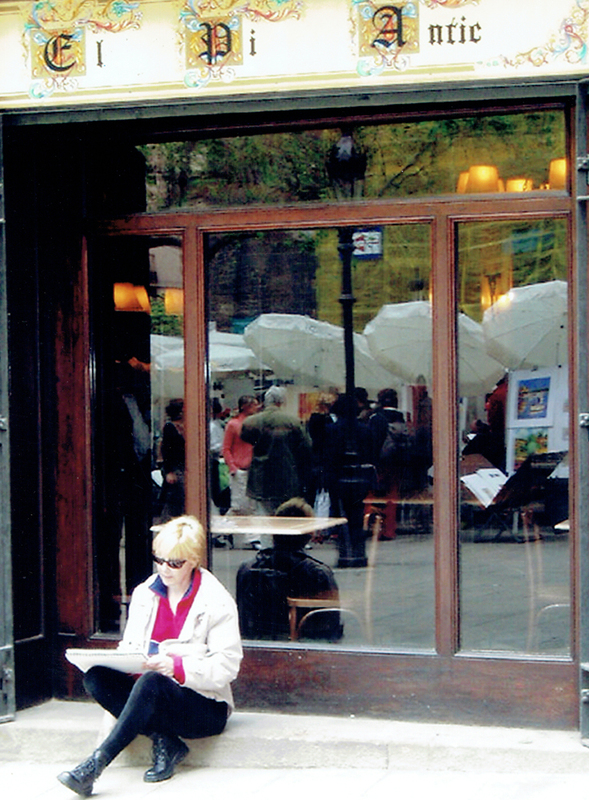 Imagine Jack’s and my joy when we happened upon this Art Show in the small square, Placa Pi! I was fascinated by the two women, mother and daughter I think, going from booth to booth carefully examining each artist’s work. After viewing the art under every single umbrella, they made a choice. Happy smiles filled their faces! The art hanging on the panel was left blank intentionally so the viewer can use their imagination to contemplate what the art connoisseurs chose! An Abstract, Impressionistic Landscape or a Still Life??????? I’ll let you decide. 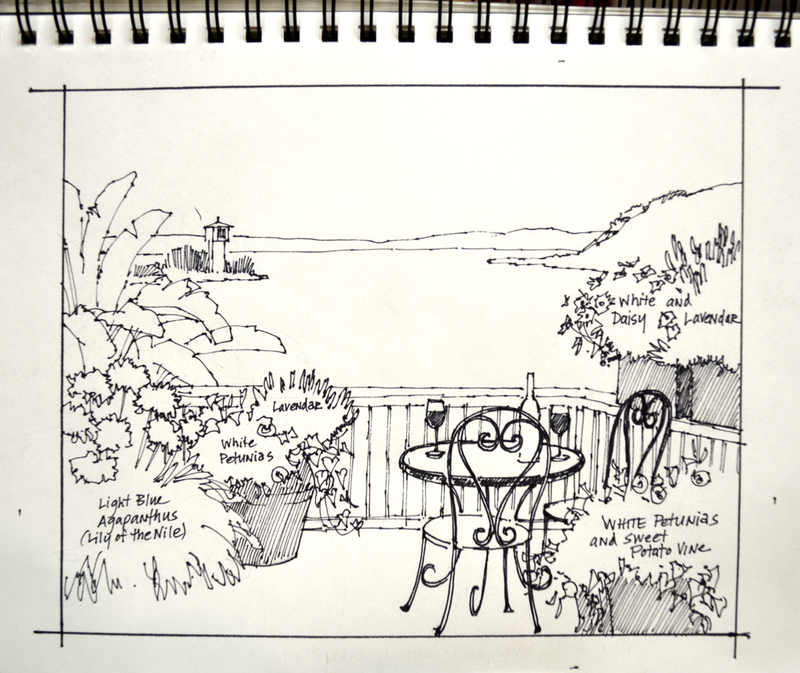 Jack took this photo of me sketching the fun! 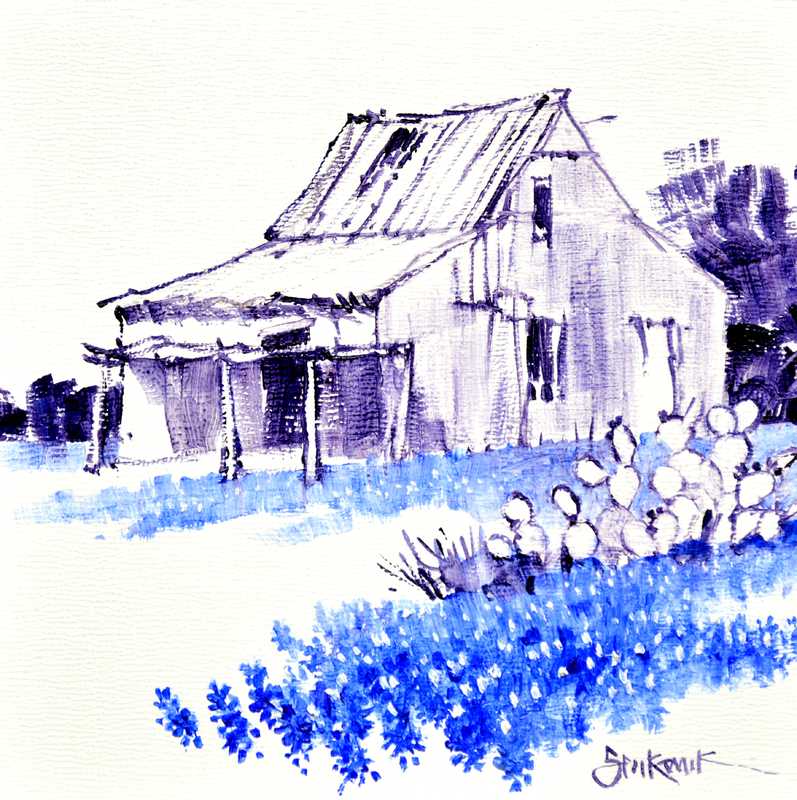 Old barns surrounded by Bluebonnets, how Texas can you get! Seems like every time Jack and I came across a scene like this we’d wonder out loud, “What would that old barn say if it could talk? How many springs do you think this one saw? 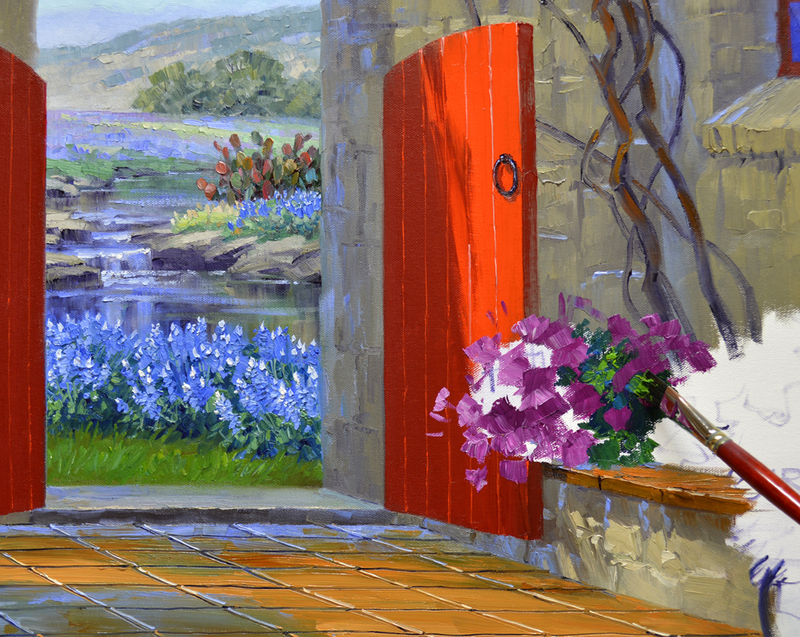 The families working there, children picking bluebonnet bouquets to take to their moms, generations growing up?” All wonderful memories! The Vignettes are designed to hang individually or as a group. The auctions are scheduled to end 10 minutes apart so you can WIN ALL THREE! The pieces would retail for $300 each but to make it more exciting I’m starting the bid at ONLY A PENNY! That’s right 1 cent! The first auction ends on SUNDAY, March 19 at 8 PM Texas (Central) Time. Petunias snuggle by the gate. The delicate blossoms are made of several shades of Magenta + White. Don’t forget, you may click on any of the images to see them larger. After masses of yellow and foliage are blocked in dark centers are added to the blossoms; our Sunflowers come to life! Let’s make that fountain play some music! 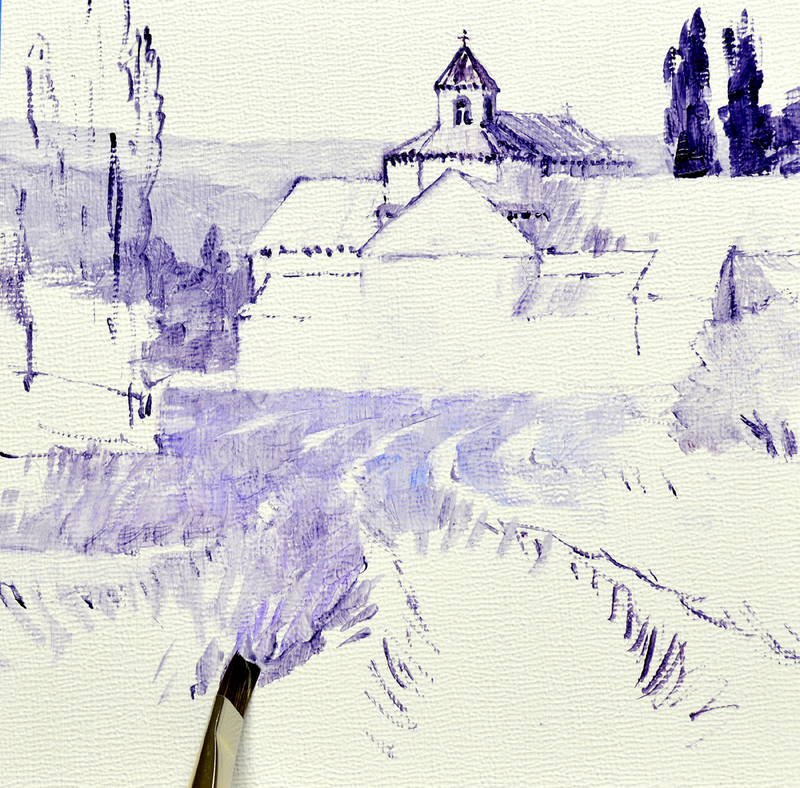 I pull strokes of White + a little Ultramarine Blue straight down with a #16 Bright (Square) brush. 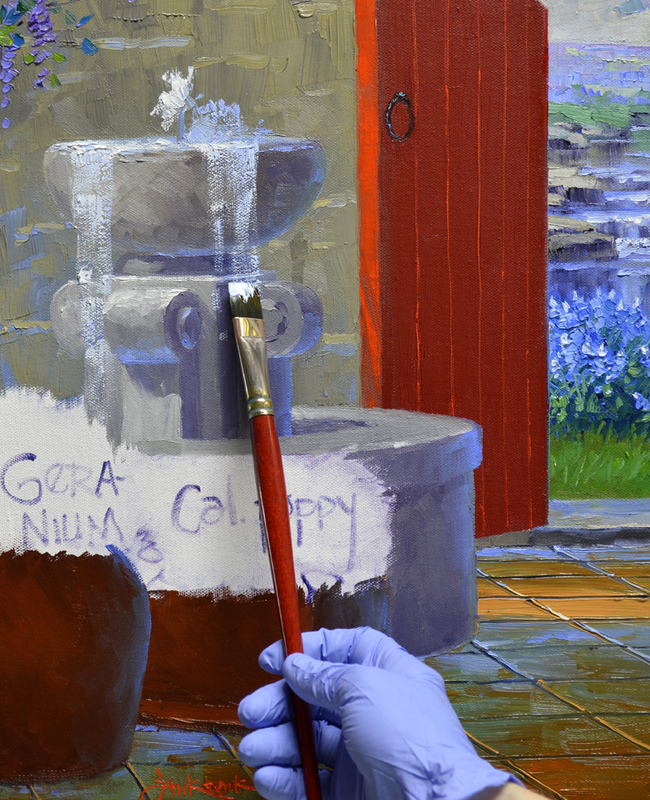 The paint of the fountain is dry, the brush is held lightly so it skips over the bumpy under painting, giving the impression of cascading water. California Poppies are grown in a container that is near the Bluebonnets in the distant field. The Blue makes its complementary color, Orange, appear brighter. 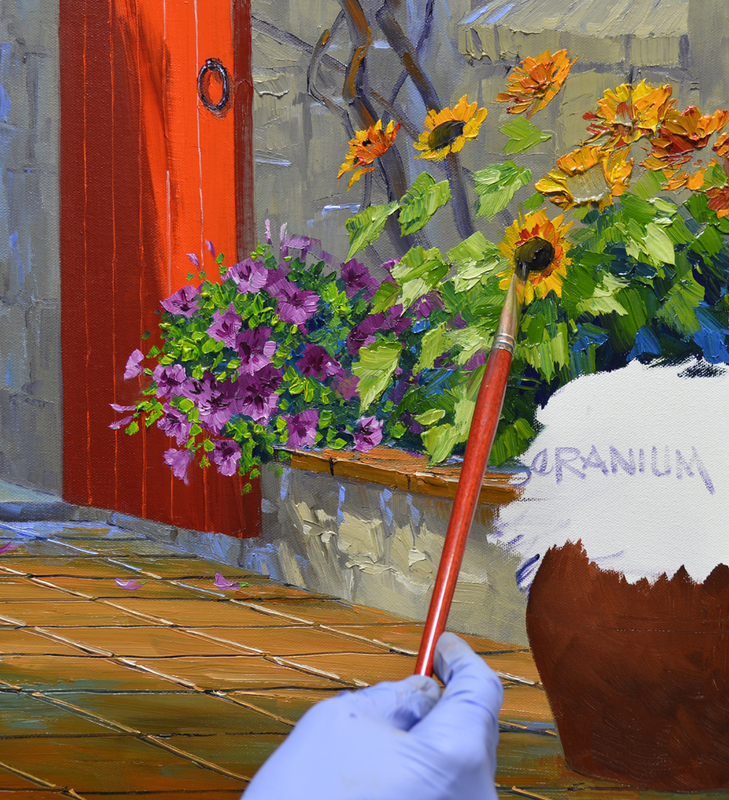 The flowers are roughed in with various mixes of Cadmium Orange + Alizarin Crimson, Cadmium Red Light and Cadmium Orange. 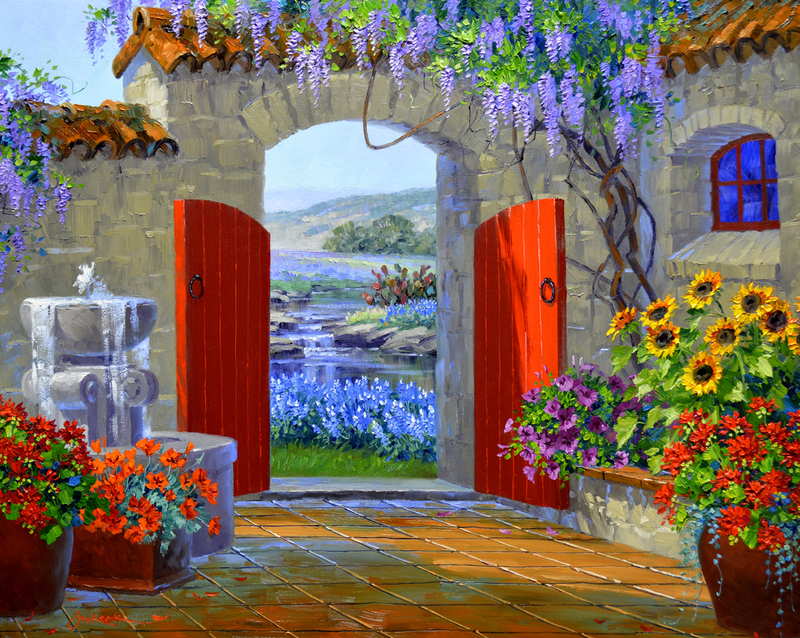 With the exception of a few I always paint flowering plants in the same sequence: Flowers First, Leaves Last. #1. 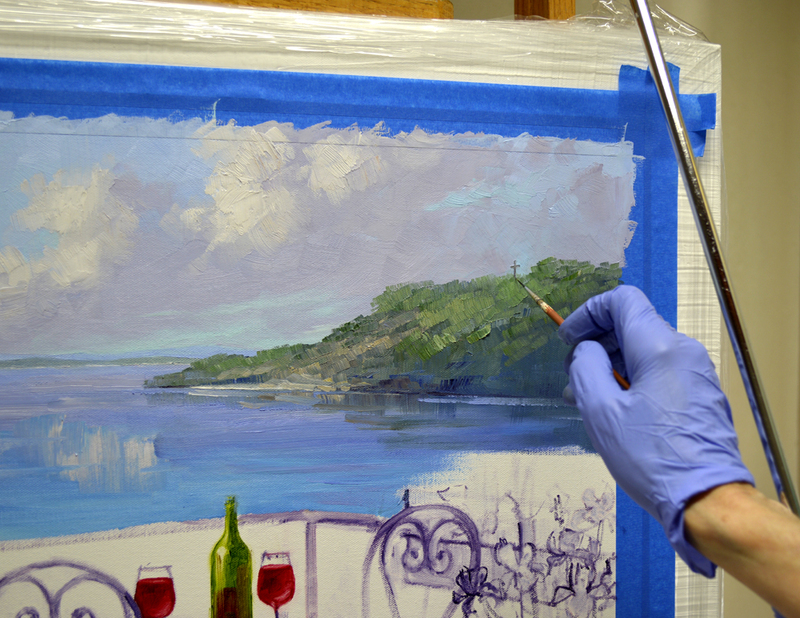 The blossoms are first blocked in with Cadmium Red Deep and Cadmium Red Medium. #2. The leaves have been painted around the masses of red, helping to shape the flowers. 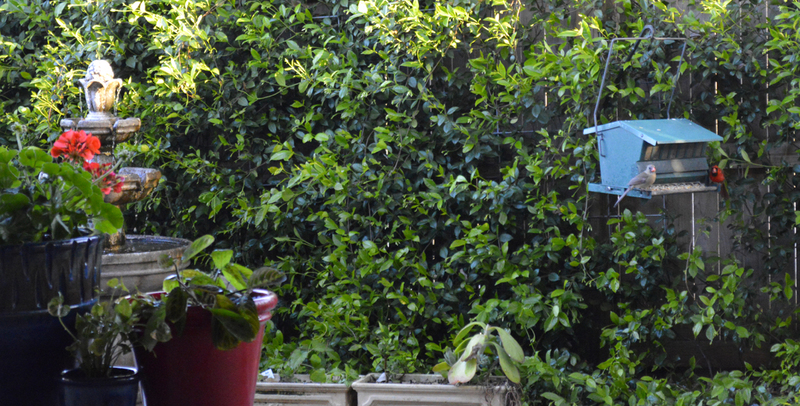 For added interest in the container on the right, I let some Silver Pony Foot vine drape down. 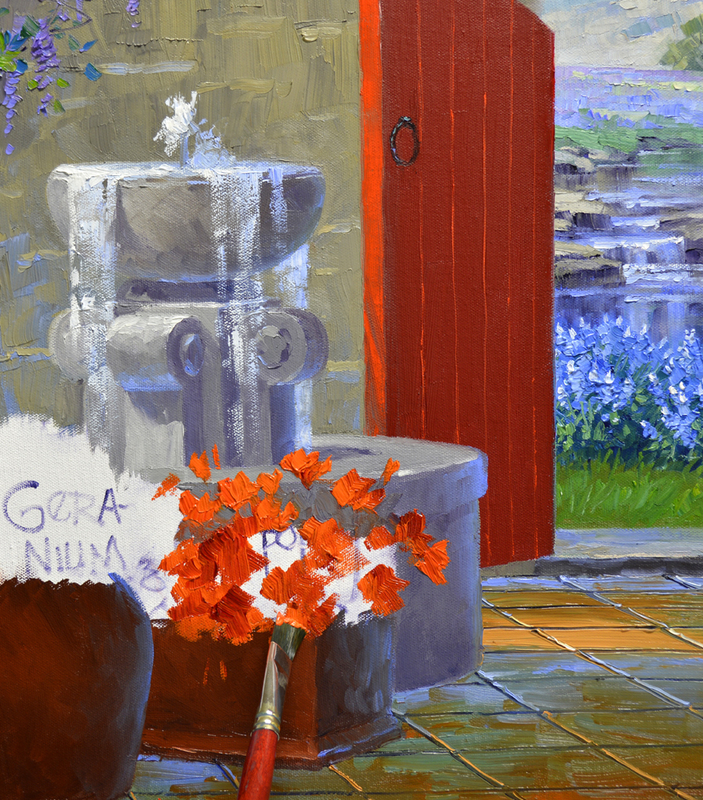 Celebrate Spring is ready to head to our gallery in Wimberley TX, Pitzer’s Fine Art. If you’re in the area please stop in and visit Rob. Make sure to go next door to his wife Lynda’s Ice Cream Shop. ART and ICE CREAM, doesn’t get better than that! 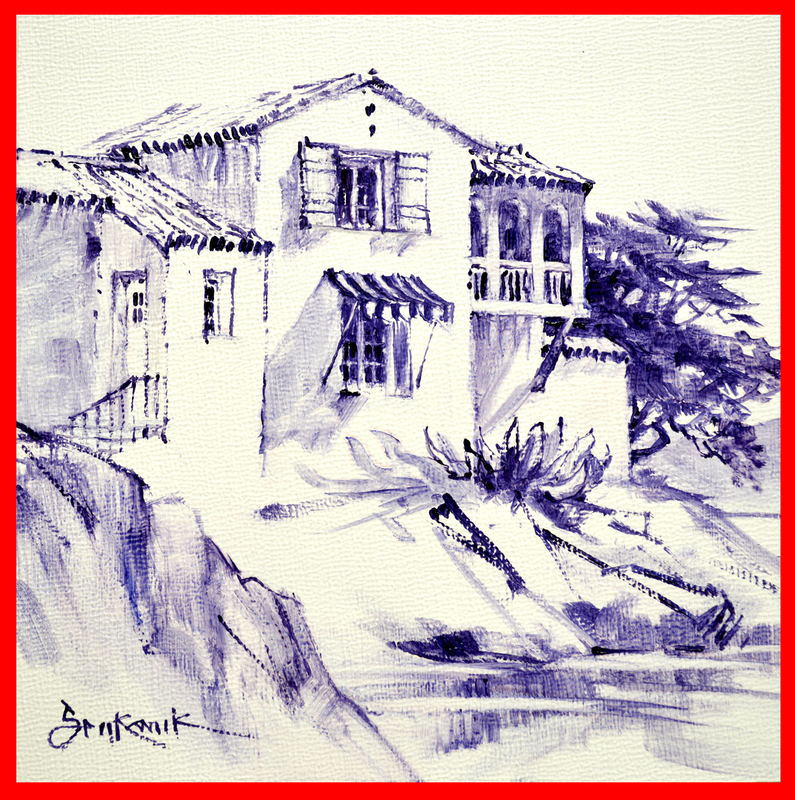 The gallery is located at 13909 Ranch Road 12. It’s on the left before you get to the square as you come into Wimberly from San Marcos. Or phone at 512.722.6032! 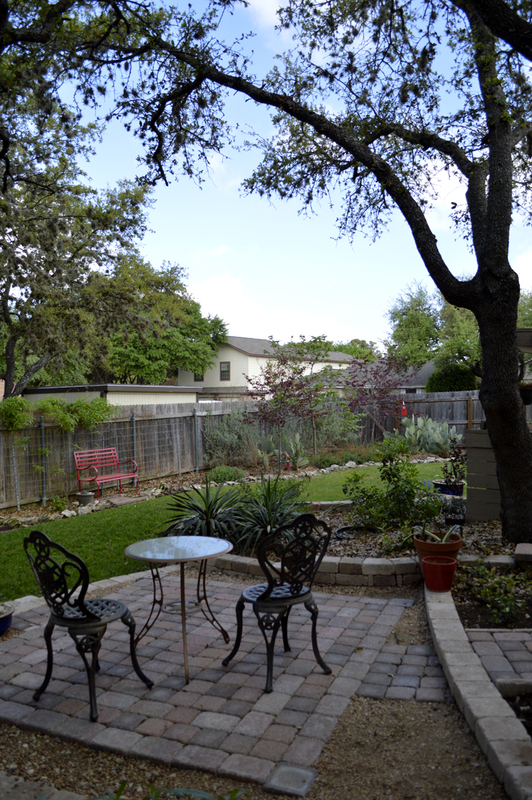 It’s certainly time to celebrate Spring around our garden, Bluebonnets are in their full glory!